The Quaint and Curious Quest of Johnny Longfoot, the Shoe King's Son. The Quaint and Curious Quest of Johnny Longfoot, the Shoe King's Son. Illustrated by Warren Chappell (1904-1991). Indianapolis: Bobbs-Merrill Co., 1947. Copyright not renewed. A Newbery Honor Book, 1948. THE CORNWALL PRESS, INC., CORNWALL, N. Y.
JOHNNY'S FATHER put the twine away and rubbed his bald head. "Johnny," he said, "Johnny my boy, shoemaker's apprentice and shoemaker's son, it is beautiful outside and the sun is as bright as a new-polished shoe. But here, in our shop, it is dark and damp, and I see that your cheeks are pale. That's a bad sign. How about a trip to the country?" Johnny snatched up a pair of shoes, slapped their heels together smartly and exclaimed happily, "Father, what a good idea! Not only are my cheeks pale, but I feel ill from the smell of all these leathers: calf leather and raw leather and doeskin. If you do really send me to the country, I'll come back so happy and healthy that I'll be able to make quite extraordinary shoes!" At this the father hugged his son, because he loved him dearly. Then, wiping his stained hands on his leather apron, the old shoemaker said, "I have no money for your trip, of course. So many people go without shoes nowadays that I don't earn much. But never mind. We have relatives in the north, and relatives in the south, relatives in the west and relatives in the east. All these kinfolk of ours live in the country and any one of them would be very happy for the son of old Peter the Shoemaker to pay him a visit. Because – and you should know this, my son – I am the pride and glory of the Longfoot family. It all started when I won a gold medal at the Shoemakers' Fair years ago." "Was it a big medal?" asked Johnny, who always wanted to know every detail. "Very big. It was the size of the heel of a six-months-old baby's shoe," said old Peter with pride. "But don't interrupt when your father speaks, or God won't bless you. Your needle will break while you work. The twine will give way. And the precious leather will rot. What was I talking about? 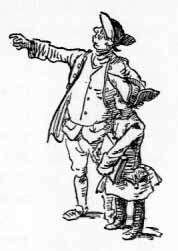 Oh, yes, I said that any one of them would be happy to have you as their guest, Johnny, shoemaker's apprentice and son of Peter the Shoemaker, called the Shoe King." Johnny sighed, because he knew that now he was going to hear the long story all over again. The story of all the shoes his father had made, of all the letters of praise and thanks he had received from kings and princes, of his deep belief that the most beautiful thing in life was to make shoes. And, indeed, Peter the Shoemaker talked about all these things for half an hour and four minutes. Then he repeated again, "What was it I was talking about? Oh, yes, that everyone in our family – "
"Would be happy to see me," interrupted Johnny. "I am obviously a very remarkable child." "You are a remarkable jackass," said old Peter severely. "You interrupt your father and you don't understand that your family will greet you with joy only because you happen to be my son. But to whom shall I send you? There is Matthew Longfoot, and Theocutus Longfoot, and Lucas, and Christopher, and Aunt Matilda – all of them Longfoots. I only wonder where you would be the happiest?" Peter the Shoemaker sat down comfortably, lighted his long-stemmed pipe, frowned his forehead into eighteen wrinkles, closed his right eye and thought. It was quiet in his workshop. A hungry mouse nibbled on one of the newly finished shoes and Johnny looked at her, wondering at her taste in food. Obviously this damp air doesn't hurt her appetite, he thought. 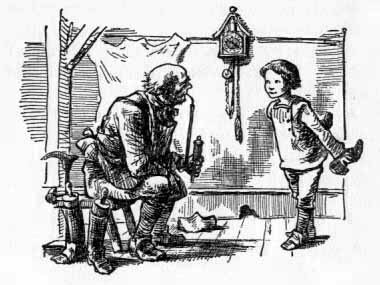 Suddenly old Peter got up and, putting his pipe away, said briskly, "You will go to Uncle Lucas Longfoot, who lives at his own country place. Do you understand, good child of a poor man? In his own country house, in a manor. And besides this house your Uncle Lucas owns two thousand acres of land and forest. He is so very rich that he could wear – if he wanted to – not one, but twenty pairs of shoes at the same time." "But he doesn't wear twenty pairs of shoes, because he doesn't have that many legs," observed Johnny brightly. "Because he doesn't have that many legs . . ." repeated old Peter absent-mindedly. But suddenly he shouted: "You! You dare to make fun of your own father! Now, one more word, just one more word, and I'll . . ."
Johnny put his whole fist in his mouth and with the other hand made signs that not one little word would pass his lips again. "Well, remember then," grumbled his father more calmly. "You don't seem to realize what luck could come to you if Uncle Lucas took an interest in you. He is very rich, lonely, childless and thrifty. Known for his thriftiness. That's why he has such a fortune." "Why do you repeat that Uncle Lucas is so very thrifty?" asked Johnny uneasily. "Oh, little birdie mine! You don't like that, do you? You would prefer for him to throw his money out the window, as I do. And you would prefer to spend your money on caviar and whipped cream. Oh, no! You shall go to Uncle Lucas. You will learn thriftiness and you will have a good rest, too." "But, Father, you never throw money out the window and I never eat caviar and whipped cream," Johnny argued. "If this Uncle Lucas of ours is really so stingy, he will starve me and you will be sorry." "I didn't say he was stingy. I said he was thrifty. That's why he has money and I don't. And if I don't have any, you won't have any either, because you are too much like me. For which I'm sorry night and day." Old Peter didn't look like a man who was sorry night and day. But he insisted on Johnny's visit to his Uncle Lucas and there was nothing Johnny could do but go. After all, this thrifty uncle won't eat me up, thought Johnny. And if he is really so proud of my father, he will welcome me and I will have a wonderful vacation. THE NEXT DAY, when Johnny left, his father gave him a handsome red leather box and said, "Neither I, nor my father, nor any of my shoemaker ancestors ever traveled without this box. It contains the best set of shoemaking tools in all the world, the best of twines, and scissors so sharp they can cut a crocodile's skin like butter, and awls that pierce even heavy metal. Take this box, and if ever you need to, you can make shoes as I have taught you. Be a credit to me, son, for I am the Shoe King and you are my prince." Crying a little, old Peter kissed Johnny heartily. Johnny wept, too, deeply touched, because he loved his good father very much. 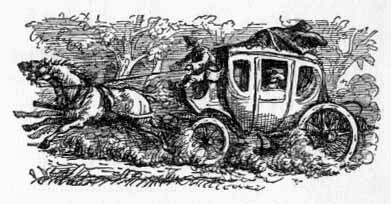 Then the driver of the stagecoach climbed to his seat, the postilion blew his horn, and Johnny jumped in. He waved through a window to his father standing in the street. Old Peter was waving an enormous red handkerchief with green stripes. The coach began to move. I'll be homesick for my father, thought Johnny, sitting silently in his seat. He is a good and kind father, and I don't think I shall like it at Uncle Lucas' house. But nobody will hurt me, because of course I am a prince since I am the son of the Shoe King. As a matter of fact the "prince" looked more like a scarecrow. He was wearing his father's coat that reached below his knees, an oversized hat that fell onto his nose, and high, very shiny boots, polished by his father in person for all of three hours. Through the window Johnny saw flowering fields, ripening corn, green hills and silvery streams that glistened in the sunlight. At each inn along the way where the coach stopped, some of the passengers got out. Sometimes new passengers got in. Once when they stopped the driver came up to Johnny and asked with a friendly smile, "Where are you going, young man?" "To Shoestring Manor, sir – Mr. Lucas Longfoot's country house," answered Johnny politely. "Then you get out at the next stop," said the driver. He added with a smile, "Very, very thrifty, that Mr. Longfoot." He was still smiling and nodding his head as he climbed up to his high seat. Evidently Uncle Lucas is as well known for his thriftiness, thought Johnny, as Father is for his art of shoemaking. But, anyhow, I'll very soon find out for myself. The coach stopped again and the driver called out in a thin voice, "Shoestring Tavern, one-minute stop – Shoestring Tavern!" Johnny got out. The coach was standing in a little innyard. "Excuse me, sir," he said to the innkeeper, "where does Mr. Lucas Longfoot live?" The innkeeper looked down at the little boy in the long coat. He backed away three steps. He thought a moment, looked once more at Johnny, this time with what seemed to be pity, and said kindly, "My poor child, why do you want to know where Mr. Lucas Longfoot lives?" "He is my uncle, my very own uncle," answered Johnny with dignity, "and he will be extremely glad to see me. I am to spend my vacation at his home." "Well, it may be that he is your very own uncle," said the innkeeper, even more kindly. "It may be also that you will spend your vacation at his home. But don't tell me that he will be glad, because that simply cannot be! Mr. Longfoot is a little odd and he certainly won't be glad to see you, even if you are wearing such a long coat and . . ."
The innkeeper acted as if he was very embarrassed. He stuttered and said finally, "You see, your uncle is thrifty – very thrifty. Maybe you'd better go back home. . . ."
"I have a very good father," answered Johnny, "but he would gladly break his pipe on my neck if I came back home in such a short time. And it is a very precious pipe and he would certainly be very sorry to lose it. So as soon as you are kind enough to show me the way to my beloved, though unknown uncle's, I shall go to him right away." The innkeeper stretched out his long, thin arm and said, "After you leave the inn you turn to the left. Then you go by forest and field, forest and field, field and hill, field and hill. Finally, dogs will bark at you, steel traps will catch your feet, a bear will jump on you, somebody will throw stones at you, and still worse things may happen. Thus you will know you have reached your Uncle Lucas'." Johnny's eyes blinked three times while he listened to these directions. He bowed politely and went to the left, by forest and field, by forest and field, field and hill. Probably my father shouldn't have sent me to my Uncle Lucas, he thought, a little worried. The innkeeper seemed to shudder when he talked about my uncle, and he was plainly scared. I don't like the queer voice in which everyone says that Uncle Lucas is "very, very thrifty." I certainly don't like it at all. And I don't like it that the way to my uncle's house is by forest and field, field and hill, by something else and then a bear jumps on you and still worse things may happen. He took a rest on the green meadow. After a while he started walking again on a wonderful road. The forest smelled of pine, the sunshine dripped like transparent silver and gold through the red needles of the trees, the moss was as soft as a thick, deep rug and squirrels danced on the branches, twinkling their beady eyes. The meadows were beautiful, embroidered with daisies and poppies. In the fields stalks of grain bowed their heavy heads toward the earth. Johnny breathed the fresh country air with delight and filled his nostrils with the sweet fragrance of many wild flowers. It's so beautiful here, he thought. It's even worth having trouble with dogs and bears, and even getting some stones on my head. He recalled the innkeeper's directions: "By forest and field, forest and field, field and hill, field and hill, and then the dogs will bark. . . ."
And, indeed, as soon as he was over the hill three enormous, dark, shaggy dogs with blazing eyes stood in his path. "We shall eat you up, eat you up," they barked defiantly. "Gentlemen dogs," said Johnny, "don't be angry with me. I am Johnny Longfoot, son of the Shoe King." For a moment the dogs stood still. They liked the polite way the little man in the long coat talked to them. Curly said to Brownie: "Let him alone. Just think! He is a prince. Certainly he brings our master, Lucas Longfoot, a big treasure from his kingdom." All three dogs crouched low before Johnny and Spotty asked, "What does Your Highness bring our master and his faithful servants?" Johnny thought for a moment and answered proudly, "Myself! And that is a very beautiful gift." The dogs looked at one another, and Curly said, "That's our master's business. We are only dogs, after all, and we can't decide about such clever matters. The prince can proceed and we will show him the way, so no ill can befall him." They all walked together alongside a high wall. Every few steps Curly barked, "Take care! Traps! Watch where you step!" And Johnny walked carefully to avoid the heavy springs hidden in the long grass. Farther on Curly barked orders to the squirrels, who were sitting in a row on top of the high wall with big rocks in their paws, with the obvious intention of throwing them down on Johnny's head. "My beloved though unknown Uncle Lucas is very well guarded, indeed," said Johnny to Curly. "Besides us and the squirrels and the traps, there is the bear that hugs every stranger to death," said Curly. "And each one of us is trained by our master for offensive and defensive fighting." They went on in silence, which was finally broken by Curly. He said in a low voice, "Well, now it starts. . . ."
"What starts?" asked Johnny uneasily. "Our master's land," said Curly. "Do you see that little wicket gate in the wall? That is the main entrance to the grounds. Behind that wicket gate sits Fuzzy the Hugger. "Fuzzy! Oh, Fuzzy – open the gate. Open it quick. We bring a prince who has a great treasure for our master. He is a very noble and unusual prince, attired in a coat reaching far below his knees." From behind the wall sounded a mighty growl. "And what does the prince bring for me, Fuzzy the Hugger? Yes, how about me? Arrh, Arrh!" A nice household! thought Johnny. My Uncle Lucas is very thrifty, his bear is very greedy and the dogs are very noisy. If I were to tell them now that the only gift I brought Fuzzy the Hugger was myself, he would swallow me like a peanut. And while I might not taste very good to him, my father would certainly be very sorry to lose me. "Arrh, Arrh," roared the bear. "What did you bring for me?" "Quick, answer him," ordered Curly. "He is hungry and in a very bad temper." Standing before the gate, Johnny said, "I brought you a load of honey and nuts. But there was so much honey and so many nuts that I was unable to carry it all myself. At this very moment ten noble knights are pulling these wonderful delicacies through mountains, forests and deserts. While we wait, Fuzzy dear, I am going to teach you to dance." In two months I will be far from Shoestring Manor, thought Johnny. I'll be back home with my dear father and I'll be rid of these dogs, bears, squirrels, and also of my thrifty, famous, but still unknown to me, Uncle Lucas. Now I can only play for time. Evidently Fuzzy liked the idea, because a soft growl came from behind the wall. "All right. Fine. I will wait for the honey and the nuts. And I've been waiting to learn to dance for a long time, as I am very musical and very graceful." There was a crash behind the wall, then the rattle of loosened chains. At last the gate was flung open. Johnny entered his uncle's estate. He shook hands with Fuzzy, who turned out to be remarkably thin. The dogs barked triumphantly, "The prince, the prince! The prince has arrived and has brought gifts! A handsome prince in a long coat has come to see our master, Lucas!" On the threshold of the house appeared a tall, thin man. His lips were tight and his eyelids were red. His long nose almost touched his mouth. He was dressed in a sack with holes for his head and arms. His arms and legs were like dry bean poles. "This is our master, Mr. Lucas Longfoot," announced Curly softly. Very skinny, indeed, my Uncle Lucas, thought Johnny. When the host is that thin, there is not much food near by. And suddenly Johnny felt very hungry. Uncle Lucas approached slowly. He stared in surprise at the little boy in the uncommonly long coat, with a red leather box under his arm. He looked him over from head to toe and then asked severely, "Who are you? And why did the dogs and the bear let you come in here? And why didn't the squirrels smash your head? I can't understand it." "I am Johnny, son of Peter the Shoemaker, known as the Shoe King. Good morning, dear Uncle. I came here to spend my vacation with you. My father said you would be very happy to see me." Uncle Lucas opened wide his eyes and exclaimed loudly, "Happy? Happy that a relative comes to eat up everything, to ruin me, to destroy me! Do you think I can afford it? Even if I fed you nothing but dry bread, the expense would be too much for me. My doctor doesn't allow me to spend any money, because it makes me so nervous I could become ill. And I certainly doubt that you could swallow that bread, if you knew how sick each bite would make me." Here Uncle Lucas started to cry bitterly. Heavy tears rolled down his hollow cheeks, dropping to the ground. He bent over, picked them up, put them in a little oystershell and explained, "Waste not, want not. Never waste anything. Tears are very useful as a substitute for salt." Oh, this uncle of mine is dreadful, thought Johnny. He gets nervous at the thought that I may eat his dry bread, and he uses tears instead of salt. "I don't want any favor from you," he said. "My father told me not to cause you any extra trouble. He suggested that for breakfast every day I eat only ten slices of bacon, three quarts of milk, twelve eggs, ten pounds of cherries, and . . ."
Johnny stopped, because Uncle Lucas was getting very pale. "Terrible, terrible," he whispered. "This little boy could eat up all the food of the whole world. This is not a boy, it's a crocodile! I'm afraid of him and I shall send him away as soon as possible. He has already cost me a lot of money just by breathing my air and putting his foot on my ground." He asked Johnny in a strained voice, "Tell me, relative mine, do you always eat that much at home?" "Indeed I do," said Johnny proudly. "Everything I was talking about my canary eats for breakfast. But now I am on a diet and therefore I eat like a bird." "All right," exclaimed the exasperated Uncle Lucas, "all right, you monstrous crocodile-boy, but to be able to eat that much you must have plenty of money." "My father, as you know, is the Shoe King. He doesn't even count his gold any more." Johnny's father, of course, had no gold. But Uncle Lucas misunderstood what Johnny had meant. "Oh," he breathed heavily, "if your father has so much gold he doesn't even count it, you must be a rich relative. Of course, that changes everything." Little Johnny was a very clever boy. He immediately noticed the difference in Uncle Lucas. If the idea that my father has plenty of money makes my dear uncle so happy, thought Johnny, I will make up another story about it just to please him. So Johnny said quickly, "Father sent me here principally to find out whether you needed any help from us. I have to spend my whole vacation here just to find out. And I have promised to teach the bear dancing. Big loads of honey and nuts for him are on the way." "You must be very rich," said Uncle Lucas enviously, forgetting that he had a barrel full of gold in his basement. "I have a little buried money of my own," stated Johnny modestly. He was telling the truth, because some time ago he had buried a penny under a tree. "I should have known that you were a rich boy by your handsome coat and boots," said Uncle Lucas thoughtfully. "But, Johnny, look at the difference between us. I, your uncle, go barefoot and wear a sack. I've already spent many a sleepless night worrying about what I will do when they wear out." "I'll make you some beautiful shoes," said Johnny, "and a leather jacket. Then you'll look very elegant." "Dear child," exclaimed Uncle Lucas, "you are like a bright ray of sunshine in this poor house. But where can you find leather for the shoes and for the jacket? Besides, you will need thread and a needle. I don't have anything of that kind. I am the poorest man in the world. I don't own a thing." "But how about this house and these grounds, the fields and the forests?" asked Johnny. Uncle Lucas answered in confusion: "Oh, those! It's strange I didn't notice them. I have a headache very often and no memory at all. I am sure that such a rich boy as you can find some leather for his uncle. But we will talk about that later. In the meantime, cry over my unhappy fate, my nephew. Cry, my child. . . ."
And he handed Johnny the oystershell to gather the tears because he wanted to store up more salt. Johnny noticed, however, that there was a gap in Uncle Lucas' plan. Gathering tears, sewing the jacket, making shoes, were all very well. But how about the meals? Uncle Lucas seemed to have forgotten them. "Your doctor, Uncle Lucas, does not permit you to get excited, but my doctor does not permit me to go around hungry. Either I get plenty of bacon, cherries, butter, milk, eggs, cream – and all of it the best quality – or there will be no shoes, no jacket, and I will leave. In which case I'll be unable to find out whether you should get my buried money," added Johnny, thinking about his penny molding away between tree roots. Uncle Lucas groaned heavily. Johnny opened his red leather box and showed him his fine steel tools. It certainly would be very bad to let this rich relative leave, thought Uncle Lucas. His greediness struggled with his stinginess. And groaning again, almost desperately, he said, "I don't have to tell you again, dear nephew, how poor I am. There is no doubt that I cannot provide the quantities of food your crocodilish appetite requires. But, if you wish, I can give you the dogs and the bear and you may go into the forest, mountains and valleys beyond the border of my ruined lands and look for food over there. But, first of all, look for the leather for my jacket and my shoes. I will tell the animals to obey you." As Johnny could clearly see, his stingy uncle wasn't giving him a thing. In fact, Johnny not only had to find his own food, but feed his uncle's animals as well. 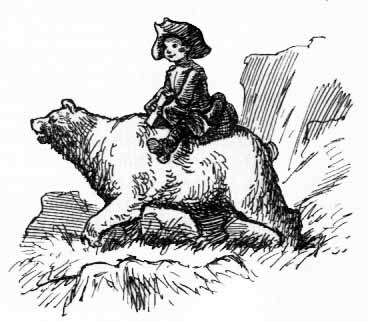 But the little shoemaker's boy was cheerful and brave, and he thought, It will be lots of fun to go out in search of food under the protection of a powerful bear and three big dogs. This uncle of mine would starve me if I stayed here and the fresh air makes me hungrier than ever. So he said, "With great pleasure, Uncle Lucas. We will go now and we will bring back something good to eat." "If you really do that – you can . . . you . . . you . . . you can use my oven to cook this 'something good,' on condition, of course, that you bring some wood to make the fire and – "
"And that I build you a castle and work for you for a hundred years," said Johnny. Hunger was making him feel angry. "Well, my boy, I didn't steal that oven, you know. I had to pay for the bricks in real, good money, and bricks get worn out by fire. I am not so rich as you, crocodile-boy." With this Uncle Lucas crossed his thin arms on his chest and looked at Johnny angrily. "All right, all right," said Johnny. "Tell the animals to follow me. I am very hungry." 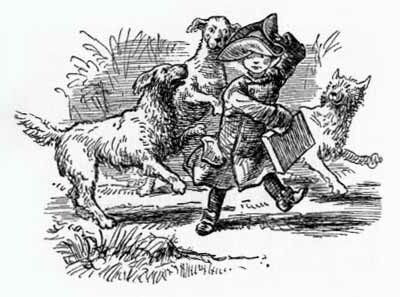 Uncle Lucas shouted his orders to the animals and sighed with relief when he saw his nephew going away. "Terrible boy," he muttered to himself. "One more day and he would have ruined me completely." Then he sat down on a bench, took from a hiding place a piece of stale, dry bread, wet it with tears from his shell and started to eat. "All of this made me so tired," he said, "I really need this rich dinner." 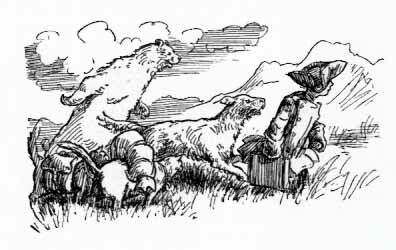 JOHNNY, the dogs and the bear left Uncle Lucas' estate and soon found themselves on a large meadow. "What shall we do now?" asked Curly. "We have been hungry for five whole years. We have forgotten how it feels to have a full stomach. You must be very smart, prince, since you were able to talk our master into letting us go. Now be even smarter and find us something to eat." Johnny looked at the scrawny dogs, at Fuzzy's eyes dimmed with hunger, and said pityingly, "Poor animals, my very unusual uncle is a rich man. He owns forests and fields, yet he doesn't even feed you. Let's go straight ahead and I'll look around very carefully. We don't know what luck might come to us." They walked briskly and Johnny looked to the right, then to the left, to the right again and to the left again. His neck ached from turning his head. He even squinted his eyes, looking and looking for luck. One, two, three hours passed. Fuzzy was growling softly from hunger. Johnny comforted the animals as best he could. But there was no food anywhere in sight. Suddenly Johnny stopped in amazement. He was standing at the edge of a big forest. On one tree a piece of bark had been cut off very neatly and an inscription had been written on the wood. "What is this!" he exclaimed. We, Barnac the Cat, summon to Catnap, our famous estate, all the skillful, the very skillful and the most skillful shoemakers of the world. A princely reward lies in store for the man who performs a dangerous task. "Who is this Barnac and what is this all about?" asked Johnny. "Ever since I left my father's workshop, all the people and all the animals have been behaving very strangely." "I don't know what this is all about, but I can tell you who Barnac the Cat is," answered Curly. "He is a black cat with white stripes. He has extremely green eyes, placed very wide apart, and they shine very brightly at night. For many years he worked for many people in many countries. Then others started working for him. Finally he came to this country, bought himself a magnificent estate and lives there surrounded by a number of faithful cats." "That means that we can have a grand dinner at his home," cried Johnny. "Let's go!" Pressing his red leather box under his arm, Johnny quickened his step. Luckily, Barnac's estate was not far from there, and in a few minutes they could see Catnap, high on a steep hill. "Oh!" exclaimed Johnny. "How wonderful and how strange!" Indeed, never in his life had Johnny seen anything like Catnap. Barnac and his cats loved to walk on roofs and in attics. Everything lower than the top floor was as unpleasant for them as the basement itself. Therefore Barnac had had built on a cliff many very steep, sloping roofs with chimneys and small windows leading into attics. Underneath these roofs there was no eighth floor, no seventh floor, no sixth floor – there were no floors at all. There was just the cliff with its extraordinary roofs. Everything at Catnap was steep, tall and vertical. Big poles rose toward the sky. Windmills turned swiftly. And on all the hills, cliffs and roofs and at the swiftly turning windmills there were cats, jumping, miaowing, turning somersaults, dancing on four paws, on two paws, on one, on their tails, or on the tip of their noses. Seeing all this, the dogs closed their eyes and Curly said, "I shall go crazy! What repulsive cats! I just can't stand it! I'll have to chase some of these monsters!" "If you or Brownie or Spotty," warned Johnny, "even so much as bark once at the smallest cat in this catty Catnap, Fuzzy will attend to you on my orders. Thanks to these monsters, as you call them, you will have a good dinner. I give you my word for it. I, the prince and king's son." This time Johnny forgot to add "shoemaker's apprentice" and "son of the Shoe King." In any case, the dogs held their tongues. But they were nervous from being near so many cats. Their noses twitched and they kept sniffing the air. Fuzzy said in a low voice, "Those cats are much cleverer than you! I have yet to see a dog who could jump on a roof. Keep quiet – or I will make you keep quiet." On the highest chimney of the highest roof Barnac the Cat was sitting. He was eating a smoked mouse as an appetizer before dinner. The sight of him eating was more than Johnny could stand. In a voice coming right from the bottom of his empty stomach he exclaimed, "The Cat is eating!" "The Cat is eating!" howled the dogs and the bear. In the meantime, all the cats had become aware of the strangers. Two cats with sharp claws approached the travelers. "What are you doing here?" one of them asked. "Don't you know that dogs are not permitted here? Squire Barnac hates those stupid animals. And how did the bear get in? And you, little man in a long coat with a red box under your arm? You look like a gypsy, because you are traveling with a bear, or like an organ-grinder, but you have no barrel organ. Altogether, the whole thing looks rather suspicious." And the cat's voice rose threateningly. Johnny knew that a critical moment had come. He had to impress these cats right away, or everything would be lost. He turned his head a little so as not to see the unpleasant long sharp claws ready to scratch him, and said, "How do you do? I am glad to know you. But you don't seem to know who I am. Be quiet and listen closely! You have an unusual visitor before you. Behold Prince Johnny, son of the Shoe King, a shoemaker's son of great renown. Not another word! Be off! Twirl around on your paws and run to your master. Tell him I am here!" Hearing these words, the cat bowed deeply and apologized, "My fault, my fault, Your Excellency, my fault. I beg your pardon." And off he ran to Barnac. A moment later something whirled and swished through the air. 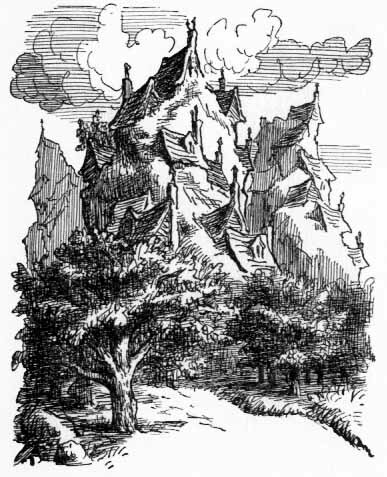 It was Barnac, who lightning-like was descending in circular jumps from his chimney. After one last, final, magnificent jump he landed just two inches from Johnny. "Do you know how to repair shoes?" he asked, without any introduction. "That's the only thing that interests me at the moment. It is of no importance whatsoever whether you are a prince traveling with dogs and bears, or whether you're a prince traveling with a whole zoo." This is a very clever cat, indeed, thought Johnny. He doesn't lose time talking about unimportant matters. "I am Johnny the shoemaker, son of Peter the Shoe King," he said loudly. "I know all the secrets of the shoemaking art, and I carry with me the best tools in the world. I am able to repair any shoe known to man, even one without soles, heels or uppers." "That would mean you could repair a shoe which does not exist," remarked Barnac. "I wouldn't demand so much as that. But I do have an important task for you to perform. If you complete it successfully, I will give you three pounds of gold, half a pound of precious stones and a shorter coat. You would look much better in a shorter one, you know. 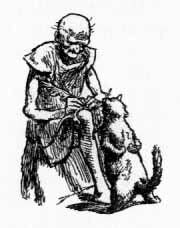 But should you fail, my cats will scratch you into ribbons." Without any hesitation Johnny answered, "The idea of the task interests me. But I can't continue discussing these matters with you until my animals and I have had a filling dinner. We have just come from Mr. Lucas Longfoot's and — "
Barnac the Cat laughed heartily. "And Mr. Longfoot is v-e-e-e-e-ry thrifty," he interrupted, "and the whole neighborhood knows it. Hungry people don't work efficiently. I know that very well. Even lowly mice get food on my estate. Not much, of course, but anyway something." "And then they are eaten up," said Johnny. He pointed his finger at the last bit of smoked mouse, which Barnac still held in his paw. "These are my neighbor's mice," answered Barnac calmly. "I never eat my own mice, except when they ask me too many questions." He stared at Johnny with a cold, green look. Suddenly the gay little shoemaker's apprentice didn't feel like talking any more. Barnac miaowed shrilly and two fat cats, wearing white aprons and starched white caps, came bounding up. "Listen, cooks," Barnac said to them, "I give you three minutes and twelve seconds to prepare a delicious dinner for this boy. Another dinner, as delicious, for the dogs and a third, as delicious, for the bear. While you cook, my secretary will read you a book entitled Five Hundred and Four Recipes for Delicious Dinners for Animals and Men. It should help you greatly in your work." Barnac had no sooner finished than the cooks jumped on a steep roof and entered the kitchen through a small window. They started to cook with unprecedented speed. Barnac's private secretary sat on the roof and read in a thin voice from a thick book about cooking for men, dogs and bears. At the end of exactly three minutes and twelve seconds, Johnny and his friends were enjoying a delicious meal. They ate with tremendous appetite. The dinner was served by thin and obviously overworked mice, guarded by a cat-guard armed with an extra claw. After dinner Fuzzy became round like a barrel and the dogs couldn't even move. "What excellent food!" said Curly sadly. "To think that when we go back to Shoestring Manor, we shall soon be starving again." The bear, who by now had some difficulty in crossing his arms over his fuzzy chest, said in a very deep voice, "I don't intend to go back to Mr. Longfoot. I won't let myself be treated that way again. I shall work for Barnac. With just one of my arms I can be more valuable to him than all his slave mice and all his dancing, turning, twirling and jumping cats." "When someone considers an old stale, dry piece of bread, wet with tears, a good dinner, he should really live alone," added Johnny positively. "I think even a dog's faithfulness is out of place in such circumstances. I, Prince Johnny, tell you not to go back to my uncle." The dogs looked at one another. Brownie said slowly, "We are dogs, so naturally we are very faithful servants. On the other hand, even the worst master loves his dogs and cares for them. But Mr. Longfoot loves only himself. Therefore he can't really be our master. So there's no reason for us to go back and die a miserable death from starvation." And they decided never to return to Uncle Lucas. Johnny left the table, shook hands with his friends, who wished him luck, and with some difficulty climbed onto the roof. There he met Barnac, who was sitting quietly, catnapping and catching sunbeams on his long eyelashes. "Many thanks for the excellent dinner," said Johnny politely. "I am ready to listen to you now." "Listen then," said Barnac. "Beyond high, snow-covered mountains, beyond foamy seas, there is a coral island as red as blood. 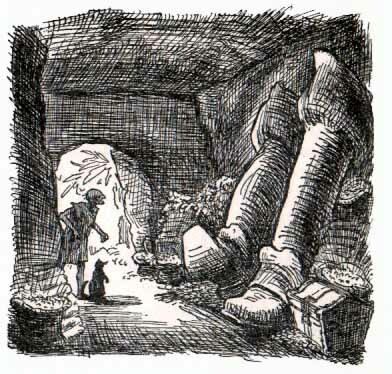 Two giants once fought for treasures hidden there, and the winner took over the island and everything on it, including a pair of old boots. They were seven-league boots, quick-walking boots. "Cats from every corner of the world keep bringing me news about these boots – house cats and wild cats, prowling cats and cats that live on ships sailing the Seven Seas. And now a sea cat who travels on pirate ships has just brought me the latest news: the dreadful giant is no more and so I could easily get the boots. "If you will undertake this task, you will have to go to the coral island, get the boots and change them to fit me. It's up to you to do it so carefully that they do not lose their magic strength. One step – seven leagues; another step – seven leagues again. That's the way they've always been and that's the way they must remain." Johnny sat thinking. Yes, he was a very good shoemaker, indeed a fine one. But he had never done a job like this before and he was a little afraid that he might ruin the precious boots. On the other hand, he remembered what he had heard his father say: "Nothing venture, nothing have." So he answered, "Oh! That's easy. Certainly I'll go. But the dogs and the bear will have to go with me." "And I will give you four cats to help you," added Barnac quickly. "If you don't trust me, prince of cats," said Johnny, a little hurt, "you can send along even eight cats, for all I care." "With the greatest of pleasure," answered Barnac, scratching the shingles of the roof with his sharp nails. "I hope you don't mind, prince, but you seem to be so smart that I don't trust you at all. The cats will go with you. They will help you a little and they will watch you a little." "And they will be in charge of the food?" asked Johnny. "Yes, they will be in charge of the food," Barnac confirmed patiently. But his tail was impatiently knocking at the roof and his eyes were sparkling and flashing green lights. It's about time to finish this conversation, thought Johnny. This cat has very angry eyes. He said, "Everything you have decided is clever. I'm ready to leave immediately for the coral island. But would you please send a messenger-cat to my uncle to let him know that we are not coming back? Let him say, please, that we have important matters to attend to." "I have a better idea. There are twelve dozen hungry mice in my cellar. They haven't had food for a week. They are being punished for having whipped the cream badly. Today is their last day without food. I think they should have dinner in your Uncle Lucas' barn." "That way you will get paid for our dinner," remarked Johnny. "You definitely are very smart," said Barnac severely. His eyes were smiling, though. He was clever and he appreciated other people who had brains. "You'd better think about my seven-league boots," he added. "This afternoon and all through the evening you shall eat, drink and rest to your heart's content, but you must start on your way at dawn." Johnny nodded. He slid down the roof and went to his friends who were resting comfortably on a green lawn. ON BARNAC'S ORDERS the prison cells were thrown open and twelve dozen mice were set free. The guards took off their chains and said to them, "Go to Mr. Lucas Longfoot and tell him that Johnny and the animals won't be back. They are going on a journey for Squire Barnac. You may eat as much as you want at Shoestring Manor. But remember, be back here at the stroke of midnight." The twelve dozen mice left, squeaking loudly. Meanwhile Mr. Lucas Longfoot was impatiently walking back and forth in front of his house, awaiting his nephew's return. I don't understand why in the world I let my animals go, he thought uneasily. That boy is as apt as not to play some trick on me. I don't trust him. He promised me so many things and now there's no sign of him. At that very moment he saw the mice crowding into the yard. "What are you doing here?" he shouted in alarm. "We have come with a message from Johnny Longfoot," one mouse replied. She repeated what the cat-guard had told her. Then she asked, "May we go now to your barn and eat our fill?" Uncle Lucas threw up his hands in horror and cried, "Miserable mice! Awful creatures! Begone! Begone! Begone immediately or I shall strangle you, burn you, drown you! I shall do something terrible to you, though I don't know yet what it will be." But there were no mice left in sight. They had all rushed to the barn, though Uncle Lucas didn't know that, of course. "Good!" he sighed in relief. "The mice have gone. But just the same I am ruined. That terrible Johnny took my dogs and my bear, and now he is going on a trip. Barnac the Cat knows a lot of secrets. They must be conspiring something. I'd feel very sick if, for example, Johnny were to find a hidden treasure and I didn't get any part of it. Since that dreadful boy arrived, I haven't had a moment's peace. The best thing I can do is to go to Barnac's, while the squirrels watch the house. It's not wise to leave with only them as guards, but I can't help it." Uncle Lucas decided, however, to look around through all the buildings before he left to see Barnac and try to find out what had happened to his nephew. He looked first into his warehouse, then into the basement, then in various places he had hidden things. Finally he had a look into the barn. And there what he saw was more than he could bear! 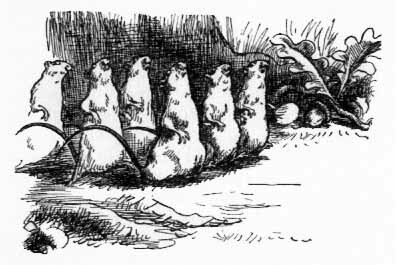 Twelve dozen mice, squeaking with pleasure, were eating the grain with the greatest of greediness. "Help!" yelled Uncle Lucas. He tried to chase the mice with his stick. "Help! My grain! My beautiful grain!" "Let's flee," cried an old mouse. "Let's flee from here! The very thrifty Mr. Longfoot wants to kill his guests. Flee!" And off they went as fast as they could scamper. 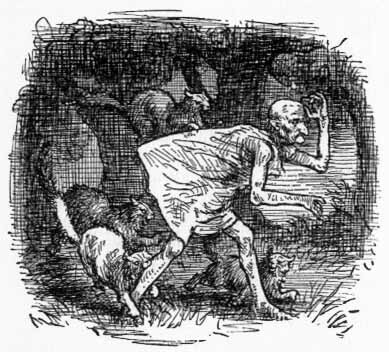 Uncle Lucas was at their heels, pale with anger, shouting, screaming and hitting with his stick at the rear guard of the fleeing column of mice. They ran through fields, over mountains and into valleys. Uncle Lucas finally got tired and slowed his pace. That allowed the mice to form regular marching columns, dozen by dozen, until all twelve dozen of them were marching slowly and in perfect order. The mice were in an excellent mood and even joked. "Isn't it nice to have a walk after dinner?" they said. "Without this walk we couldn't sleep well." Uncle Lucas followed them, breathing heavily and threatening them all the time with promises of terrible punishment. Later he started to plead with them in a voice full of false sweetness. "Mice, dear little mice," he begged, "wait a minute until I can catch up with you. Don't be in such a hurry! I was only joking! I am so glad you ate up my grain. Come back to the barn. I will entertain you lavishly. How about some cheese or bacon? I am your friend. I love mice, little mice, darlings of mine!" Tired though they were, the mice did not stop. "I prefer working for cats," said one of them to another, as they marched briskly side by side. "At least it's better than falling into the hands of this thin, skinny individual. Do you hear how his voice trembles with rage?" "I certainly do," answered her friend. "My feet get stiff from fear at the very thought that he might catch us." They all went a little faster. But as everything in this world is bound to have an end, the mice soon found themselves on Barnac's estate. There the cat-guards moved their whiskers approvingly, because the mice were back exactly on time. "Here we are," squeaked the oldest mouse. "Dear guard, put us, please, right away into the deepest prison cell, because that dreadful Mr. Longfoot is after us with a stick in his hand. He wants to kill us." "Really!" answered the captain of the cat-guard. "Go back to your work and don't worry. I'll be ready for Mr. Longfoot!" 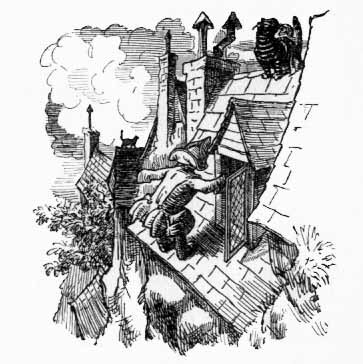 He miaowed twelve times and at once a number of cats jumped down from the steeply sloping roofs. Each was armed with extra claws. "Attention!" yelled the captain of the guard. "Mr. Longfoot is approaching. He wants to kill off our mice." "Miaow, miaow, miaow," answered the cats angrily. "We will kill him!" "Impossible," said the captain sadly. "We must never do that to a guest. We must welcome him politely. But, of course, if he wants to kill our mice, we can scratch him a little." The cats didn't answer. They jumped silently in the direction of the approaching Uncle Lucas, and when they reached him, started to scratch him. Feeling on his legs, his hands and his face many sharp claws and seeing in the darkness many shiny green eyes, Uncle Lucas screamed in terror. "Stop! Stop! You are killing me! There's some misunderstanding. Stop!" And when this did not help, he shouted, "Stop it! What's wrong with you? I am Mr. Lucas Longfoot, Barnac's neighbor. Don't you recognize me?" The cats stopped scratching him, but their green eyes stared at him stonily. One of the cats asked sweetly, "Is it really dear Mr. Lucas Longfoot?" "Yes, it's I, indeed, you terrible bandits," yelled Uncle Lucas angrily. "What terrible luck I have! What awful things happen to me! My nephew takes away my animals. He breathes my air. He puts his foot on my ground. Other people's mice devour my grain, my dear, dearest grain. And now cruel cats scratch my face, destroying my skin!" "That was a mistake, of course," said one cat sadly. "It was dark and we took you for a scarecrow. We are very sorry, indeed." "That's not so!" exclaimed Uncle Lucas angrily, feeling his face. "You can see perfectly well in the dark." "But it's not dark tonight, there's a full moon," answered another cat, giggling. "It's light and, as you say, we see only in the dark." Lucas saw that he could never win an argument with these smart cats. He said, "I didn't come here to talk. I want to see Barnac right away. Immediately. I'll have him arrested, put in jail, taken to court. I want vengeance, and payment of my expenses. I want double payment. Let me see him right away!" "Quite impossible," said one cat softly. 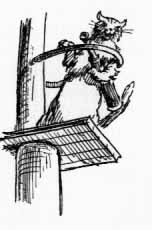 The cat pointed with his paw to one of the highest chimneys. Barnac was sitting there on the top, staring at the sky and purring softly. "What is he doing?" asked Lucas. "Our master is talking to the moon. He always does it when there's a full moon. No one is permitted to disturb him." "What does he say to the moon?" asked Uncle Lucas. He tried unsuccessfully to hear a few words of Barnac's one-sided conversation with the shiny ball. "That's what he says," continued the cat. "I can make up poetry as well as he can," exclaimed Uncle Lucas angrily. "Without even staring at the moon. "Barnac will be glad to listen to you," said one of the cats. "But not sooner than in two hours, when the moon sets. Meanwhile you may have a talk with Johnny, the shoemaker prince, and with the dogs and with the bear. They are resting over there on the green moss." "Ho! Ho!" said Uncle Lucas, angrily gritting his teeth. With long steps he started to walk toward the little group. In the moonlight he was a strange sight. He was silvery and white, except for the scratches on his face, legs and hands. He was trembling with anger. "Well, my birdies, so here's where you are!" he hissed. "We have to settle our accounts. Is this the way to act? Is this the way a loving relative behaves? Do you know how much I have lost because of you?" Once more he counted over his losses, including the grain eaten by the mice and his scratched skin. "And that's not all," he added severely. "Where is the help you promised your poor uncle? Where is all the good food you promised to find him?" Johnny was a little ashamed, because he had not yet kept his word. And although his uncle was a wicked miser, Johnny should have done what he said he would. "Don't worry, my thrifty uncle," he answered. "Sit down on the moss and eat this good sausage and this white bread and drink this delicious milk. Then, when you have rested, you should go home. You see, at dawn we start on a long journey. When we return I will bring you lots of beautiful things. I admit that it's my fault that the mice ate up your grain and the cats damaged your skin. But I will pay you back. I will make you a nice pair of shoes when I come back, and a beautiful jacket. I will keep all my promises." This crocodile-boy is certainly eager to promise many things, thought Uncle Lucas, suspiciously. In the first place I don't trust him. In the second place I want to punish him for all the harm he has done me. And finally, I want to make sure he pays me back what he's cost me. He has something up his sleeve and he's trying to get rid of me. But I won't let him fool me. "Dear nephew," he said sweetly, "I could never leave you by yourself, my child. I shall go with you wherever you go. I am going to stick to you. If you should find any treasure we will divide it between us. I'm going with you. It's settled." Now, what a situation! thought Johnny desperately. This very thrifty uncle of mine wants to go with us. What shall I do with him? He'll be in the way all the time. The dogs and Fuzzy pulled on his sleeves and whispered, "Please, don't let him go with us. Please, don't." "This will be rather difficult," said Johnny with a sigh. "But don't worry. He won't bother us too much." "What are you conspiring there in the dark?" asked Uncle Lucas, suspicious as always. "Oh, nothing," answered Johnny quickly. "We are glad you are coming with us. But this is a dangerous journey. We might get scalped and killed. Should you, however, insist on going – never mind." If they get scalped, thought the revengeful uncle, I would like to watch it. I shall know how to protect myself. "If that's so," he said decidedly, "it is my duty to go with you!" "All right," sighed Johnny. "But let's sleep now. We have to get up at dawn." He fell sound asleep right away, and Uncle Lucas, very tired, fell asleep too. In his dreams he mumbled, "My grain, my skin, everything mine . . ."
A loud purring awakened Johnny and his friends at dawn. Eight cats with bags strapped to their shoulders and additional claws tied around their necks stood there, ready to start. Barnac was with them. "It's time for you to go," he said, looking with one eye at Johnny and with the other at Uncle Lucas. "And what's my dear neighbor doing here? Why is he so scratched?" Barnac knew of course about the way Uncle Lucas had been welcomed. And, of course, Uncle Lucas knew that Barnac knew what had happened. On the other hand, Barnac knew that Uncle Lucas knew that he, Barnac, knew. So Uncle Lucas smiled sourly and said, "A misunderstanding caused the destruction of my skin. But, speaking of these matters, I wish to ask my honorable neighbor for his permission to accompany my dearest nephew on his contemplated journey, although his destination is still unknown to me." "That's quite impossible," answered Barnac positively. "If you were to go with him, I would be deprived of my neighbor. That would make me very sorry indeed. Besides, this is a very dangerous expedition. And, finally, most important of all, there's no reason whatsoever for you to go on the trip." Johnny, the dogs and the bear looked at one another in delight. But, yellow with anger, Uncle Lucas said, stressing every word, "This boy is my nephew, sent to me by his father. The dogs are mine and so is the bear. Nobody has any right to keep me from my nephew. He has been put in my care." "Here, on this estate," said Barnac slowly and threateningly, "I am the only one who decides what is right and what is wrong." "But beyond this estate," said Uncle Lucas, "there are still other laws. I could, for instance, ask the police department to hand my nephew over to me. I could also tell the police that three fierce dogs are loose without dog collars or muzzles. That would, of course, mean a very unhappy ending for your adventure." Barnac thought for a moment. Then he said slowly, "My neighbor has such a kind and polite way of asking my permission that I really can't refuse him. I only hope that if my neighbor falls into the sea and is eaten by a shark, he still will remember me with deep gratitude, even while enjoying his stay in the shark's stomach." "With great, immense gratitude," said Uncle Lucas. He was gritting his teeth and thinking, I'll get even with you for all my terrible sufferings. "Well, good-by," said Barnac the Cat. "Johnny is, of course, the head of the expedition. Everyone must follow his orders." Not me! thought Uncle Lucas. I'm too old to listen to this terrible boy. I won't even consider it! And they left with the dawn. THEIR WAY LED toward high, snow-covered mountains. Every hour the road grew steeper. The cats and Fuzzy enjoyed it, but it was less pleasant for Johnny and the dogs. Uncle Lucas didn't enjoy it at all because he was barefoot and he was weak from hunger. Johnny was sorry for the old man who walked breathing heavily and whistling through his nose. He gave orders for them all to rest every hour, and offered his uncle rolls, ham, honey and preserves from the cats' supplies. "May I do whatever I want to with this food?" asked Uncle Lucas. "Of course," answered Johnny, astonished. "But I think food is made to be eaten." "That's what you think," Uncle Lucas answered sarcastically. "Food is made to be hoarded." He slipped it into a bag tied tightly to his waist. "I don't want to get used to these luxuries," he explained. "I prefer to hoard them. Then if you run out of food I will sell them to you for silver and gold." "But what will you eat meanwhile, my thrifty Uncle?" asked Johnny in alarm. "You'll starve to death." Uncle Lucas stripped a piece of bark from a near-by tree and said, "This is excellent food. The bark is fresh and juicy. You, Johnny, have still to learn thriftiness from your uncle." Uncle Lucas can certainly make a person hate thriftiness, thought Johnny, but he kept silent. The travelers pushed on. Finally the bear exclaimed delightedly, "This is my home country! I'm happiest when climbing a narrow trail on the edge of an abyss. You'll see how nice it is farther up – snow, winds, big rocks crashing from tremendous heights. 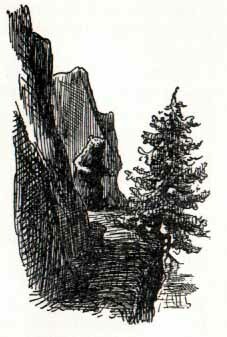 My brother bears all live among cliffs. To me there's nothing better than mountain air. It tastes better than the sweetest honey. And nothing is so refreshing as a strong mountain wind." "That's all very well," puffed Johnny. "But the road is getting more and more difficult. The rest of us can hardly climb it. Besides, stones and rocks are hard on the feet. Much as I'd like to make sandals for the whole party, I have no leather." The bear pondered the problem. Then he said, "I'll call my brothers who live in these mountains and ask for help." He hallooed loudly and his voice echoed in the distance. "Now we're in a fix," muttered Uncle Lucas, who always saw the bad side of things. "Here's where a pack of bears descends on us. There's no guarantee whatever that they won't eat us up down to the last bone." "They certainly won't eat you up," Johnny consoled him. "You are much too skinny. They like fat." "I'm safe then," said Uncle Lucas. He heaved a sigh of relief. He did not care at all what happened to his companions. And, in fact, a formidable-looking crowd of bears was approaching. They were led by a giant bear who walked on his hind legs. "Who called us, and what do you want?" roared the giant. "We want help," answered Fuzzy rather uneasily. "Help! Why should I help you, indeed? On the contrary, I intend to kill all of you and throw you into the deepest abyss. These mountains belong to us. And no man, or dog, or cat, is supposed to come here unpunished." "I'll have you know Johnny is a very good boy," said Fuzzy threateningly. He reared up on his hind legs. "I will defend him with all my strength. And I'm not so weak either. Let's be friends. In exchange for your help, Johnny will do you a great favor." "What kind of favor?" asked the giant bear, somewhat more mildly. "From what Fuzzy tells me, I understand that all bears are musical," Johnny said loudly. "So, if you want me to, I can teach you to dance. All the other bears in the world will be extremely jealous." The big bear thought for a moment. Then he turned to his comrades who were waiting in silence. "What do you think? As a matter of fact, I've heard of dancing bears, but I never believed there were such things. Now, shall we eat this whole party, or shall we help them in return for dancing lessons?" He opened his jaws wide, showing his powerful white teeth. This terrified Uncle Lucas, and although Johnny tried to stop him, he stepped forward and said, "Learn to dance! Learn to dance! It's a wonderful idea and I'd like to take lessons, too!" The bear looked at Uncle Lucas. There he stood in his shapeless sack, his skinny legs sticking out at one end, his skinny neck at the other. "If your leader can teach a person like you to dance, he can certainly teach clever and strong bears," the giant bear said. "It's settled. If you do a good job, Johnny, I'll do whatever you want." He led the travelers to a large cave. "Just see what you've done! Now I have to teach dancing not only to the bears, but to you, too, Uncle," said Johnny. "What's wrong with that?" asked Uncle Lucas. He was completely satisfied. "You saw yourself how happy the thought of my company made the bears. I don't see any reason to turn down free lessons. If there's something free, one should always take it. Besides, remember, our lives are at stake. And most important of all, my life." "Well, you asked for it," Johnny said. There was such a peculiar look in his eyes that Uncle Lucas became a little uneasy. "Listen, my boy," he said, "I don't trust you very much and I don't want you to play a trick on me again." "Uncle," said Johnny, "you are very irritating. But I really don't have time to do anything about it, since I have to teach the bears, and you, to dance." "Start the lesson," the giant bear said menacingly. Johnny answered calmly, "Don't forget, dear bear, it takes some skill to teach a bear to dance. First, I have to make you suitable shoes. And after that I need a lot of big flat stones and a lot of wood." "The bears will fetch it right away," said the giant, very much interested. "You seem quite sure of yourself, so I suppose you know what you're doing." "But I don't suppose so," muttered Uncle Lucas. "All this seems very queer to me. I'm afraid I'm going to come out on the short end again." While the bears were bringing wood and stones Johnny quickly and skillfully made wooden clogs for all the bears. He measured their paws and made one pair for each. When this work was done, he said, "Gentlemen, here you have excellent shoes, real dancing slippers. The next thing to do is to prepare the floor." He ordered it covered first with wood, then with stones. Then he set fire to the wood. When the stones were quite warm, Johnny said, "Now, gentlemen. Let's start. First figure: walking on the hind legs. Do all you gentlemen know how to walk on your hind legs?" Evidently only the giant bear and two cubs knew the trick – and Uncle Lucas, of course. Johnny ordered them all to put the clogs on their rear paws and stand on the warm stones. "We have no band to dance to, but that doesn't matter," said Johnny. "The cats can miaow and the dogs can howl and that will make perfect music." So the cats miaowed and the dogs howled beautifully, and the bears, whose front feet were getting too hot, rose nicely on their hind ones, properly shod in dance clogs. The bears hummed with the music and Johnny gave directions. "Faster! Slower! One! Two! One! Two!" 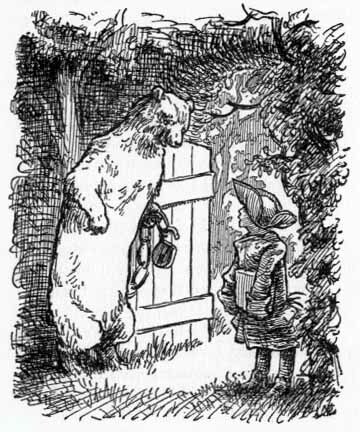 The giant bear smiled and, opening his big jaws, said, "That's excellent! This boy is very smart! Now I know it." "It will be your turn soon," said Johnny. "Yours, and the two cubs', and Uncle Lucas'." Realizing what was in store for him, Uncle Lucas pulled out some of his remaining hairs in despair and shouted, "No, I object! I protest! Help! Murder! Police! My nephew wants to burn me!" But suddenly he felt the weight of a bear's heavy paw on his shoulder and a grim voice said in his ear, "Silence! No shouting here! Dance!" A moment later, Uncle Lucas was standing on the hot floor. "I warned you that these dancing lessons wouldn't be any fun for you," said Johnny. "But you didn't believe me." He called out, "Gentlemen! Second figure! Jog! Raise your right knee, then your left. Quickly! Up and down, standing in the same place!" Uncle Lucas was the first to follow the command because he was barefoot and his feet were getting hot. But the bears soon followed suit because even the clogs became uncomfortable and it was hard to keep still. Soon, to the rhythm of cats' and dogs' music, the whole company was dancing. 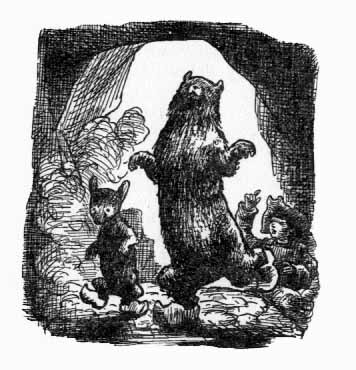 Then the giant bear said approvingly, "You are very clever, my boy, as you have taught us to dance. From today on we will call ourselves the Dancing Mountain Bears. I will make you an honorary bear, which is one of the greatest honors imaginable. This will entitle you to any help you need from us at any time." "Then help us, please, to get through these mountains and reach the shore of the foamy sea," begged Johnny. He explained about the coral island. The bear thought awhile, then shook his head and said, "That will be a long and difficult journey. Especially now. Because this is the season of big sea storms. You will have to build a very strong ship that can weather the gales. As for crossing the mountains, that's simple enough. We'll carry you on our backs." So the journey over the mountains started again, with each bear carrying a traveler on his back. Johnny was having a wonderful time. It was fun to climb higher and higher, just sitting comfortably on a woolly, soft back. He marveled at the tremendous mountains, the snow fields shining in the sun and the silvery streams rushing down the mountainsides. The cats and the kindly dogs were happy too, as well as Fuzzy, who was proud that he could dance, and that thanks to him everyone was having such a comfortable journey. Only Uncle Lucas was gloomy and very angry. It is Johnny's fault, he thought to himself, that I've been so terribly humiliated. Not only was I made uncomfortable, but I had to dance like a clown, accompanied by cat-and-dog music. I! The respected citizen, Lucas Longfoot. There's plenty that Johnny's going to have to pay for! Just thinking of it all may give me a nervous breakdown. Here's the list: He breathed my air; he stepped on my ground; he took my dogs and my bear; his friends, the cats, damaged my skin; I lost my grain; and on top of it all, he made a fool of me. That's awful. And he started to cry from grief and sorrow. But at the same time he cautiously pulled out some of the bear's hair and put it in his sack. It might be useful someday, he thought. Perhaps for a pillow or a brush. Or I might sell it. I don't know yet. But I always hoard what I can. "One hour more," said the giant bear after a while. "One more hour and we'll reach the seashore. But that's where our hard work begins." Johnny nodded. He, too, was worried about how they would reach the coral island through the stormy seas. Far away, at the foot of the mountains, the sea stretched out as far as they could see. High, green, foam-covered waves were breaking at the shore. Countless sea gulls soared above. "Here we are," said the giant bear, puffing heavily. They stopped on a high heather-covered hill. "Let's rest here." The bear lay down on his back and licked his tired paws. "Johnny," he explained, "you need an extremely strong ship. My bears can uproot you some trees from the near-by forests. They can also help you to build your ship. But we need sails, nails, tools. We could buy all these from the fishermen. But we need money." There was no money, of course, and Johnny was worried. After all, he was only a little boy in a long coat and a big hat. 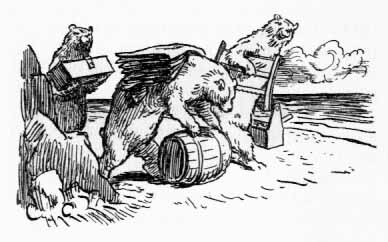 "If you'll let me and two other bears leave for two days," said Fuzzy, who had been listening, "I'll get everything you need to build a ship. In the meanwhile, not to be losing time, you could be getting the wood in shape." "That will be fine," Johnny answered happily. "You can start as soon as you want. You are a fine and good comrade. While you are gone we will cut the wood and learn to swim, which is of the utmost importance for sailors." "I am too old to learn new things. I won't," said Uncle Lucas. "And I still remember my first dancing lesson." "Then what will you be doing, dear Uncle?" asked Johnny kindly. "I'll count my losses," Uncle Lucas answered angrily. And he started writing numbers on the sand. "You might leave some space for unforeseen losses," said Fuzzy mysteriously as he left. "What does he mean by that?" asked Uncle Lucas in new alarm. But Fuzzy was already far away. THE WAVES, seeing Johnny and his party, got wilder and wilder. Evidently they wanted to start their war against the brave boy right away. But, eyeing his enemies, he called out to the waves: "Be patient, please, O mighty waves! I have to prepare myself for the coming affray. Give me time to get ready!" Johnny suddenly felt very courageous. He was ready to face the most dangerous adventures. He wanted to leave as soon as possible for the coral island, so he turned his attention to the problem of shipbuilding. "Barnac told me," he said to the cats, "that sometimes seagoing cats from foreign ships come to see him. Perhaps one of you used to go to sea." A gray, furry cat stepped forward and miaowed in a deep voice, "I spent many days and many months and many years on many different ships. On steamboats, on sailboats, on barges and ferries. I lived in ports, I lived on docks. I am a sailor by profession. In his incredible and immeasurable cleverness, Barnac assigned me to accompany you in case you needed my help." "Grand," said Johnny delightedly. "You bears fetch wood right away while we draw the plans for our ship. We must figure the length of every plank we need, calculate the number of nails, decide on the width and depth of our ship." "The water line! The water line! That's the most important thing of all. And next to it, the length of the mast and the width of the sails." "Well, what kind of ship shall we build?" The cat pulled at his whiskers, which made him look like an old sea captain, and said, "We could build an Egyptian galley, a Roman trireme, a Spanish caravel, a galiot, a corvette, a frigate, a tartan or a clipper. All of these are seagoing ships. And long ago they were used for distant journeys. If we built a galley, we would, of course, expect Mr. Longfoot to row day and night, night and day, as slaves always did on Egyptian, Greek or Roman ships. Pirates sailed in galiots. 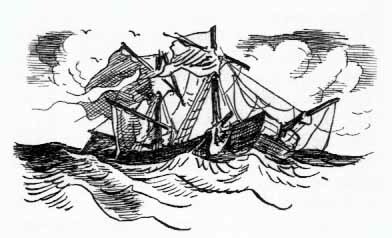 Smugglers sailed on tartans or frigates. And Columbus discovered America in a caravel and — "
"But we are not Egyptians, or Romans or Greeks," interrupted Johnny. "Nor are we pirates or smugglers or Christopher Columbus. So forget about your tartans, clippers and corvettes, learned Captain, and remember: Mr. Longfoot is my uncle and no one will make him row day and night, night and day." "Nobody," repeated Uncle Lucas, with deep satisfaction. "Gentlemen," said the cat, "I wanted only to show that I know about all kinds of ships. We will build a big, strong barge with two good sails. That's all." The cat started to explain how to build this ship, and Johnny listened carefully for two days. In the meantime, the bears worked hard, bringing big trees to the shore. The dogs barked at the waves to tease them. The waves beat on the shore. The giant bear politely ate up all the honey offered him by the cats. And Uncle Lucas, paying no attention to anyone, sunned his skinny body for hours. At the end of the two days Fuzzy and his two companions were seen approaching in the distance, heavily loaded. "What are they carrying?" Uncle Lucas asked curiously. "Linen for sails, hammers, nails and saws," Johnny explained joyfully. "Good old Fuzzy!" Fuzzy greeted his friends gaily. He nodded rather coolly to Uncle Lucas, and started to unpack his load. He had indeed brought everything they needed: lots of linen for sails, carpenter's tools, nails, tar and ropes. "Excellent! Wonderful!" miaowed Captain Cat. "Now we can build a strong and fast ship." Everyone congratulated Fuzzy and everyone was happy. Only Uncle Lucas was silent. He peered intently at the supplies spread on the beach. "What's the matter, Uncle?" asked Johnny. "You're looking at all these things as if you'd like to eat them up." Uncle Lucas opened his mouth wide and let out a high-pitched scream. "This linen! This linen! These nails! This tar! Everything is mine! Mine! Mine!" "What do you mean?" asked Johnny. "What do I mean?" Uncle Lucas shouted in such a terrible voice that everyone drew back. "Fuzzy knows what I mean! I had this poor supply stored in my basement to save for my old age. Fuzzy stole everything. And I'll have him put in jail, hanged or shot." Fuzzy lifted his heavy paw and growled menacingly. "Wait a minute. You can't say that about me. I didn't steal them. I borrowed all these things. They were uselessly rotting, moldering and rusting in his basement. I bor-row-ed them." And everyone repeated in chorus: "He bor-row-ed them." "I knew at once there must be some misunderstanding," said Johnny. "No one wanted to cheat you, dear Uncle. You always imagine such dreadful things. Fuzzy just borrowed these things from you. Think how happy you'll feel, knowing that thanks to you we'll all travel so comfortably." But Uncle Lucas became even angrier. "I won't be happy! I've never lent so much as a pin to anyone in my life. You'll bend the nails when you drive them into the wood. The linen will be torn by the wind and ruined by the water." Uncle Lucas threw himself down on his treasures and hugged them tightly to his heart. Johnny didn't know what to do. Of course the things belonged to Uncle Lucas, and he could do with them as he wanted. But on the other hand, they needed all these things so badly. Johnny looked at the bears, the dogs and the cats as if to ask their help. 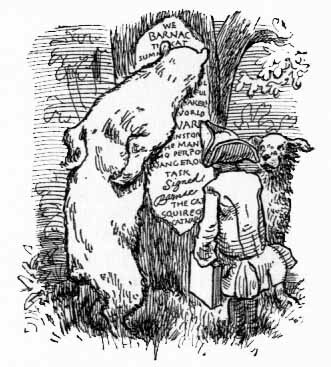 "We will take them from him by force," said the giant bear threateningly. 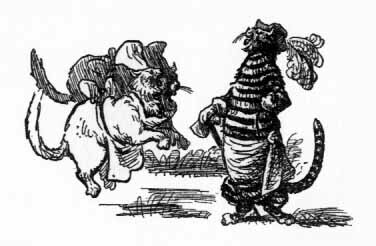 "Let's take them by a trick," said the cats, smiling slyly. The dogs didn't say a word. They pretended to listen to the roar of the waves. "I'm always having to make such weighty decisions." Johnny sighed. "And, after all, my trade is to fix shoes and not to lead strange expeditions across stormy seas. Barnac sent you cats along to help me, so now you settle this matter with Uncle Lucas. What we do about the sails, nails and tar is your master's business, not mine." Captain Cat approached Uncle Lucas and said: "It's all a misunderstanding. Let's start all over again. Let's put it this way. I meet Mr. Lucas Longfoot at the seashore. He's loaded with all these things. And now I want to buy them from him with real, good money." At this Uncle Lucas got up, put his hand to his ear and listened carefully. "I'll pay you," continued the sly cat, "four bags of gold, four bags of precious stones and four bags of ermine for the linen, nails and tools and other things brought by Fuzzy." Uncle Lucas got pink, then red, then purple with joy. Shaking the cat's paw heartily, he shouted happily: "Oh, noble cat! You are not like my terrible nephew or this dishonest Fuzzy. Now you're talking business. I agree. Of course I agree, because it means good business for me. Take all the things." "This cat must be crazy," muttered Fuzzy. "Well, now, give me the gold, the precious stones and the ermine," said Uncle Lucas, jumping for joy on his skinny legs. "I don't even want to go to this coral island of yours. I want to go back to my estate and count my treasures for the rest of my life. I'll listen to the jingle of gold and carefully caress my furs. Hurry up. Give me all these marvels." "Sorry," said the cat calmly. "All these treasures don't belong to me, but to my master, Barnac. And they're all on the island. You can understand that I can't carry such immense quantities of gold and gems with me." Uncle Lucas could understand that. But he was not pleased. "How can I be sure you'll pay me?" he asked suspiciously. "We'll sign an agreement," answered the cat. "Here's permission from Barnac for me to sign in his name." He showed Uncle Lucas the permission, which was written on a piece of rat's skin. "I agree. What else can I do?" sighed Uncle Lucas. "I've always had a soft heart and can't refuse anybody. But because of the delay, you'll have to pay double. That means eight bags of each: gold, gems and ermine. Barnac will still be rich." All the animals were angered by this uncommon greediness. The giant bear roared, and it was evident he wanted to attack Uncle Lucas. And the dogs snapped at his legs. But Captain Cat held up his paw to command silence and said very calmly: "That doesn't matter. On the contrary, I think that for your great kindness you deserve ten times more. You will be paid forty bags of gold, gems and ermine." "That's too much! There are not that many treasures in the world!" said Uncle Lucas in a trembling voice. And he pinched himself to prove all this wasn't a dream. "Well, in any case, I'm ready to sign such an agreement in Barnac's name," said the cat, still more calmly. "Barnac is immensely rich and it's a trifle to him." Mr. Longfoot didn't answer. Breathing heavily, he quickly wrote his name on the rat's skin. The cat scratched his own name underneath and handed the skin over to Uncle Lucas. "Now all this linen and the other things belong to us," said Captain Cat. "Oh, yes," answered Uncle Lucas. "Now you can do what you want with them. Build our barge quickly so I can get to the island and get my treasures." "We'll start building my barge right away," said the cat in a strange voice. And they went to work immediately. Even Uncle Lucas lent them a hand. Thanks to the giant bear's tremendous strength, the work went fast. 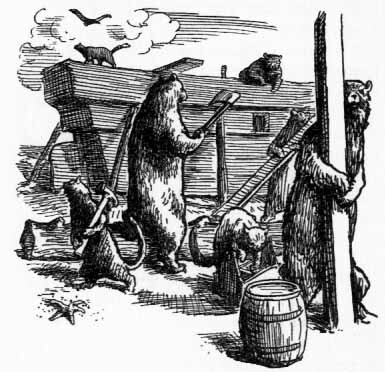 It was a magnificent spectacle indeed: all the big furry animals chopping and sawing wood, building the barge, carrying the mast, and growling as they worked. Johnny worked too, taking orders from Captain Cat. His job was to sew the sails and calk the barge with tar. As a matter of fact, he thought, if a person knows how to make shoes, it's no problem to build a barge. A barge is just a big wooden shoe. Finally the mast was in place and the barge rolled gently in the waves near the shore – shiny with tar, her snow-white sails spread proudly, her broad deck gleaming in the sun. There were even some cabins below decks to make traveling more comfortable. "What name shall we give the ship?" asked Captain Cat. "Her name will be The Dancing Bear," said Johnny, after thinking awhile, "as proof of our deep gratitude to all the bears that helped us build her." The bears were very proud and happy. Right away they performed a nice dance on the sand. "And now," said the giant bear, "take advantage of this wonderful weather and leave at once. We will go back to our mountains. Don't forget us. Come again. But your uncle, dear Johnny, is banned forever, because he is stingy and mean. We can't look at him without anger." "What do I care?" exclaimed Uncle Lucas, although he was very much ashamed. "I am now as rich as a king and I can do without the company of simple mountain bears. Let's go." Not paying any attention to the others, he hurried to the barge. But there was a surprise awaiting him. All the cats were standing on deck in a row, guarding the ship. And Captain Cat, with his front paws outstretched, stopped Uncle Lucas as he started to come aboard. "Sorry, but this is my barge. I mean, she belongs to my master, Squire Barnac." "So what?" asked Uncle Lucas, astonished. "I have to come on board to sail to the coral island to get my treasures." "This is my barge," said the cat stubbornly. "And if you want to go, you will have to pay." "That's ridiculous!" exclaimed Uncle Lucas. "Neither Johnny nor the dogs are paying for the trip." "That's my business, not yours," answered the cat. "But you will have to pay if you want to go." Uncle Lucas was furious. But thinking of the tremendous treasure awaiting him on the island, he had to agree, although reluctantly. "Your greediness amazes me," he said. "I didn't expect this after all your kindness and cleverness. How much must I pay for this little crossing? I want the cheapest cabin, and no food." "On my ship there is only one class, food included," the cat answered calmly. "The price for the crossing is forty bags of gold, forty bags of precious stones and forty bags of ermine." "Forty bags and forty – and for-for — " stuttered Uncle Lucas, rubbing his eyes. "Are you crazy?" "No more crazy than you, who asked this very price for some linen and nails," laughed the cat. When Uncle Lucas realized that the cat really meant it, he began to cry. Why do all these terrible things happen to me? he thought. Now, either I don't go to the island at all and never even have a look at my treasures, or I do go and everything that I get I have to pay for my journey. Everything – to the last piece of gold, to the last precious gem, to the last piece of fur. He cried desperately for a long time, collecting his tears in a shell as usual. "I am lost!" he exclaimed. "I shall die of sorrow. It's all Johnny's fault. There's no justice in the world." Then he shouted, "No, no, it's impossible! You must see that it's impossible! I could probably give you one or two gems and one fur. Let's bargain." "Why not?" said the cat calmly. "We can talk it over. It might quiet you down. But there'll be no change in my price." So, while Uncle Lucas bargained with the cat the others all went on board and waited patiently. Then Captain Cat took his place at the wheel and said dryly, "We start in five minutes. Stop all the talk." Johnny looked at Uncle Lucas. He stood in water up to his waist. He was holding tightly the ladder that dangled from the ship. He was crying and moaning in despair. "Dear Uncle," said Johnny, "don't get so excited. You'd better come on board. I know by the determined look in his eye that the captain will never give in. You'd better give him the agreement you signed on the rat's skin. One loss more or less doesn't mean so much. Maybe you'll have good luck on the island." Four minutes and fifty-nine seconds passed. "One second more," said the Captain, in a still drier voice. Uncle Lucas pulled out his last four hairs, threw the rat's skin to Captain Cat and jumped aboard. He was so unhappy and so cold that Johnny took pity on him. 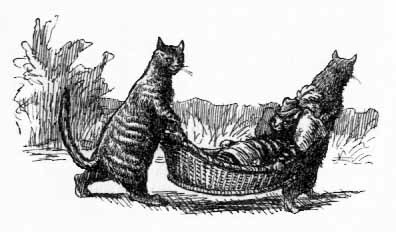 He rubbed him dry with a soft linen cloth and forced him to drink a glass of hot milk from the cats' supplies. He then put him to bed in a cabin. Bewildered by all that had happened to him, Uncle Lucas was as weak as a baby and let his nephew take care of him. He fell asleep immediately. Meanwhile, the barge cut through the blue waves, rolling softly, and the shores quickly disappeared. CAPTAIN CAT was in charge of the boat. The dogs, the cats and Fuzzy worked under his orders. They furled and unfurled the sails and their oars dipped rhythmically into the sea. The fresh salty air made them all feel good. Johnny stood on the deck, lost in thought. So many unusual things had happened to him since he left his father's dark workshop. This was a wonderful vacation – and still more wonderful things might happen. He counted on his fingers. First there was Shoestring Manor and Uncle Lucas; then Barnac's estate, cats, mice and Uncle Lucas. Later on there were mountains, bears, dogs, cats and Uncle Lucas, of course. Then the seashore, shipbuilding, and always, always Uncle Lucas. Now the crossing, whales, sharks, sea creatures of different kinds, and maybe even a storm. And later . . .
Johnny smiled with deep satisfaction. He thought, This is an exciting life. I can't understand why my unhappy Uncle Lucas doesn't enjoy it. News travels fast at sea. The sea gulls were the first to spread the news about the little boy and the sailing barge. They had overheard Johnny talking to the dogs and cats. They took the word all over the sea about the little shoemaker and his voyage to a far island to get the seven-league boots. "Here comes the boy shoemaker," chirped the sea gulls. 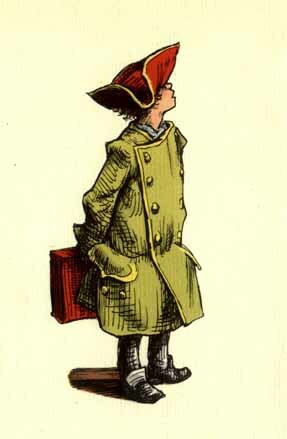 "Here he comes, the shoemaker prince, in his long coat and big hat. He'll fix the boots and then walk in them from island to island and from seashore to seashore." They evidently didn't know the boots were to be fitted for a cat. The winds carried their words to the whales, and sharks, and giant sea crabs with mighty claws, and octopuses. And the waves murmured: "On the stormy, wild, immense sea, a boy is sailing to Coral Island." An old pirate shark thrashed the water with his scaly, rough tail and croaked, "The sea belongs to us. And all the islands belong to us. We don't want any men around. If we let even one man in, others will follow. They will hunt us with harpoons, they will drive us into nets, they will kill the whales and rake the bottom of the sea looking for pearls. Death to all men!" Rising rapidly from the depths of the sea and pushing the waves aside with force, the old shark put his head above the waves and repeated: "Death to all men!" A school of sharks followed him. 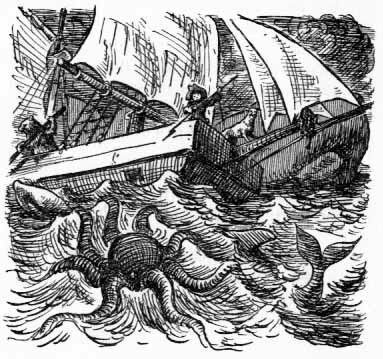 Big octopuses joined them and stretched their long tentacles toward the barge. Giant sea crabs clattered their sharp claws. And finally the King of the Seas, the whale, repeated in a deep voice: "Death to all men!" "Let's surround the barge," said the pirate shark. "Then let's overturn her, make a hole in the bottom, sink her, and eat the whole company up." "We'll pull them down with our tentacles," murmured the octopuses. "We'll cut them into pieces with our scissors," croaked the crabs. The barge by now was completely surrounded by threatening creatures of the sea. "I don't like the looks of things," said Captain Cat uneasily. "There's a school of sharks behind us. I see octopuses. And I hear whales pounding through the water." "Is there any danger?" asked Johnny. At that very moment the barge was severely rocked by several sharks who were butting the ship with their foreheads. "The seafolk are attacking us," miaowed Captain Cat in alarm. He didn't lose his presence of mind, however. He gave orders quickly. "Everybody on deck! Fuzzy, arm yourself with that big pole. Shove off the octopuses and the crabs. Push the sharks away. All cats – man the mast and unfurl the sails!" A second later, each member of the crew was at his task. Fuzzy performed miracles of courage. His enormous strength spread destruction among the enemy. 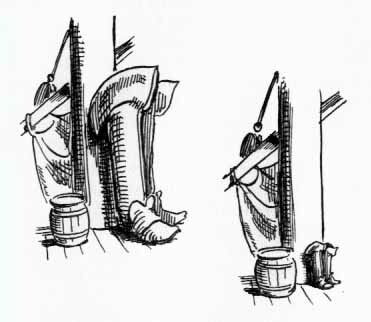 Johnny attached his shoemaker's awl to a long stick and fought fiercely. The dogs bit the octopuses' long tentacles. Uncle Lucas, awakened by sounds of the struggle, climbed up the mast and shouted: "Dear crabs! Dear sharks! Lovely octopuses! Gentlemen whales! Please don't fight us. Don't destroy this ship. If you must have something to eat, why not eat my nephew Johnny? He's fat, very tasty and smart. And he knows how to repair and sew every type of leather and skin." "My dear Johnny," said Captain Cat to the boy, "never in my life have I seen such an uncle as this." "I'm sorry for him," said Johnny, still fighting. "Sorry because he doesn't know how to laugh, because he's so stingy, and a coward besides." Suddenly the turmoil ceased. The octopuses sank silently to the bottom. The crabs stopped rattling their claws. And the sharks swam away. From the depths of the sea came the voice of the pirate shark. "Ahoy, you there, on the barge! Is it true that the boy is an expert leather and skin repairer?" "Ahoy," miaowed Captain Cat, "you in the water. Why do you want to know?" "We want to talk things over," answered the deep voice. "Well, then, send someone aboard," miaowed the cat. He called to Johnny in the same breath: "It's the first time Uncle Lucas has been of any use to us. He praised your tasty meat, but by mentioning your good craftsmanship he's told them about another use for you, I suppose." In the meantime two giant crabs climbed aboard and rattled their claws three times in sign of greeting. One of them said: "Let's get to the point right away. Answer yes or no. Never mind the fallen soldiers. For several months some of our high sea officials have been suffering from bad wounds. Three sharks had their skins torn by harpoons. One has a sore tail, cut by a sharp cliff. And there's one wounded baby whale. We want you to stitch and repair all these skins. In return we will spare your life. Yes? Or no?" "Yes," said Johnny quickly. He liked the crab's direct approach. "Bring me the shoes – I mean sharks and whales – and I'll get started right away." "Just a minute," answered the crab. Bending over, he made sharp taps on the deck with his closed claw. Dot-dash-dot-dot-dash-dot-dot-dot . . .
"That's the Sharks-Whales Sea Code," said Captain Cat, who knew everything. And, indeed, in a moment four enormous sharks and a baby whale appeared on the surface. Although a baby, the whale was ten times as large as the barge. "I can't ask all this nice crowd onto our deck," said Johnny. "I'll have to jump on their backs with my tools and repair their torn skins that way. But what guarantee have I that they won't eat me up?" "We'll stay on the boat as hostages," said the crabs abruptly. "Besides, we give you our sea word that nothing bad will happen to you." "I trust you," said Johnny. "And such being the case, I don't need any hostages." He jumped immediately onto the back of the worst wounded shark. It was the hardest job he had ever tackled, because the shark's skin was so tough that no needle could pierce it. Johnny had to drill holes for every stitch. And the skin was so big he had to divide it into small sections before he could start to patch it and polish it. But when the work was done, the shark's leathery skin looked like new. When he saw his reflection in the water, he splashed his tail with delight and said, "What perfect work! Today I'll give you a Sea Passport so that you can pass freely throughout the seas. You can go through shallow water, swim through medium water, and dive through deep water and no seafolk will do you any harm." "Thank you, Mr. Shark," said Johnny. "I like the idea of a Sea Passport. Not because I expect to spend all my time diving, but because I consider it an even greater honor than my father's gold medal." Then Johnny started working on the other sharks without losing any time. Meanwhile, the baby whale was getting quite impatient. "It's my turn," he cried. "A storm is coming and you won't have time to mend me or stitch me up." "I'll begin on you right away," exclaimed Johnny gaily. "I'm not slipshod in my work, you know. My work is perfect. It takes a little time. Don't rush me and I'm sure you'll be satisfied." 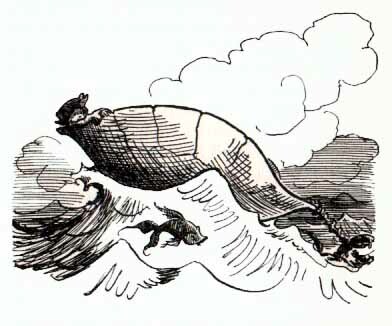 And he jumped onto the whale's back. In the meantime, Uncle Lucas was watching everything very carefully. He thought to himself, Another boy would certainly have been eaten by the sharks. But Johnny is so lucky everything turns out right for him, although he's a naughty boy who has hurt his uncle in many ways. I wish there were some way he could be severely punished. Evidently the gloomy, wild sea winds wanted to fulfill this wish. While Johnny was still working on the whale, the sky suddenly became very dark. A deep roar was the signal of an approaching storm. 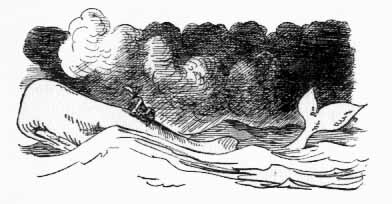 A terrifically strong wind suddenly struck the barge with tremendous force, whirled her around like a nutshell, and pushed her ahead with enormous speed. "Have you finished your job?" asked the whale impatiently. "I just hate these winds. I want to dive and hide myself under water. Why are you so slow?" Johnny's situation was desperate. 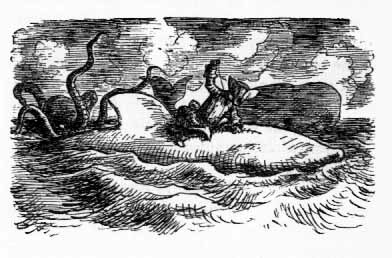 His boat had left him, and here he was on a whale's back. And now the capricious creature wanted to dive deep into the sea. What could he do? Holding on tight, and trying to shout louder than the winds, Johnny cried to the whale, "It's really a shame you want to dive right now. I intended to fix you a new type of skin, completely unknown among seafolk. A skin as shiny and colorful as a rainbow. You would be much more handsome than any other whale in the world. But such a job would take time, of course." "I saw the sharks' skins," answered the whale. "There's no doubt you know how to do a good job. But really, I don't feel comfortable here. I could easily catch cold from all this wind. I already feel all my whalebones getting stiff. I think the best thing to do would be to go as quickly as possible to the nearest island. I know a quiet bay there, protected by high cliffs. We could stay there until you fix this extraordinary skin for me." I'm not yet lost, thought Johnny, hanging onto the whale's back. The most important thing is to feel solid ground under my feet again. Although the shark promised me a Sea Passport, I don't think I was made to swim and dive all the time. I hope I'll be able to find the barge. I can figure a way to find it when I get to the quiet bay. Captain Cat is an old sailor and I'm sure he saved our ship somehow from destruction. With no effort at all, the whale swam through the high seas. The storm raged. The sky looked like a plate full of ink, except for great streaks of lightning which struck the waves and filled the darkness with white light. "One hundred and forty more tail movements," said the whale, "and we'll be there." Soon he slowed down, made one turn, blew big streams of water through his nose twice, and swam into the bay. Inside, all was calm. The water rolled softly and slowly over the sandy shore at the foot of great granite cliffs which formed a wall back of a narrow sandy beach. "Mr. Whale," said Johnny, "I'm tired, hungry and wet. I couldn't work now because my hands are shaking from holding on so tightly. I couldn't make even one stitch. Let me go on shore where I may find something to eat, and dry myself properly. Later I'll work on you." "I have plenty of time," said the whale. "I think I'll take a nap for the next two or three days. I still don't understand how a little bit of water can bother you so much. But men are just different from whales, I guess. For all I care you can get as dry as a dry piece of toast. That's up to you." "Is the coral island far from here?" asked Johnny, while climbing up the cliff, his red leather box under his arm. "I can't give you any information about that," answered the whale. "That's a big sea secret. All the seafolk have to keep it." Keep it, then, thought Johnny, as he jumped from one rock to another. First I have to eat and rest. Then I'll figure out a way to find the coral island and my friends. But in the meantime, here he was on a desert island. To his great surprise there were many pineapple, coconut and banana trees, so he had an excellent meal. After a while a strong wind blew away the clouds. The kindly sun looked through and his rays warmed the boy's chilled body. Johnny picked out a comfortable spot on the clean sand, covered himself with huge coconut leaves and, completely exhausted, fell asleep instantly. In the bay, meanwhile, the baby whale slept too, and dreamed of his new rainbow skin. WHILE JOHNNY was traveling on the whale's back and arriving with such good luck at the bay, his friends on the barge were facing great danger. Strong winds tossed the barge as if it were a toy, throwing it from one side to the other. High waves crashed on the deck, one after another. At every moment their end seemed nearer. Captain Cat, his hair bristling like needles, gave orders from the bridge. The dogs, the cats and Fuzzy worked valiantly, not wasting a minute. They still hoped for a happy outcome. Only Uncle Lucas, of course, gripping the mast tightly and trembling with fear, talked, talked, talked all the time. "I am lost! I am ruined! My sails are drenched by rain and torn by wind! My sackcloth suit is ruined. I am poor, tired, blown to pieces by the wind!" Nobody paid any attention to him. Nobody even listened to him. "A little more patience! A little more effort! The wind is slackening and we'll pull through," miaowed Captain Cat. They all went on working. They bailed out the water that kept pouring into the boat, and they stuffed rugs into the spreading seams. Suddenly from the lookout a voice boomed out: "Ahoy! Land to starboard!" Captain Cat blinked his eyes. He looked carefully at the island they were approaching, and miaowed, deeply moved: "Coral Island! Coral Island! The home of the seven-league boots!" Then, pressing his forehead with both front paws, he exclaimed in despair, "But Johnny! What has happened to Johnny? Johnny the shoemaker. The poor boy must have perished in the terrible storm. What will Barnac say? He will blame me because he put the boy under my protection. There is nothing for me to do but commit hara-kiri and die." I never wanted Johnny to perish, thought Uncle Lucas Longfoot. But evidently Heaven has punished him for all the harm he did me. Now I'm his heir and therefore in charge of the boots and treasures on Coral Island. "If Johnny's dead," he said, "I'll take over command. I was born to command. Everyone will have to obey me implicitly." This idea displeased Johnny's friends so intensely that each attacked Uncle Lucas in his own way. The dogs nipped at him; the cats clawed at his suit; Fuzzy slapped him several times with his heavy paw. Captain Cat said severely: "You miser! You selfish man! People like you can't command because no one would listen to you. No one respects you. However, because of dear Johnny's memory, I won't let you be harmed. Only remember, I don't even want to hear your voice again. Be silent, and happy that you're alive, and that we treat you so generously." So Uncle Lucas had to leave the group. He went to the other end of the barge and looked around gloomily. Just wait, he threatened them in his thoughts. Wait and you'll be sorry. You'll see what Lucas Longfoot is going to do to you. The travelers made one last effort and landed the boat on the shore safely. They had to fight the waves to the last. Completely exhausted, they fell on the red coral shore. The storm ceased after a while and the bright sun shone again. Sitting on the sand, they all rested and ate until they could eat no more. Then Captain Cat said, "There is no doubt that dear Johnny perished. The wind was terrible and the waves must certainly have snatched the poor child. He must have drowned. As for us, I really don't know what to do now. Barnac will hang us all if we come back without Johnny. He warned me before I left that I would have to pay with my head if anything happened to the boy. Therefore I'm afraid to go back. I think I'll make this island my home. I might travel on the barge and take up my sailor's life again. What happened wasn't my fault and I don't want to be hanged. Once when I was a kitten a bad girl hung me on a doorknob and I was saved only by a miracle. I have very unpleasant memories of that incident. I wouldn't like to have it happen again." "We will stay with you!" exclaimed the other cats. "Our tribe will be known as the Coral Island Cats." "I will stay too," said Fuzzy. "I love Johnny so much that I can never be happy again without him. I'll never dance again, although Johnny taught me how. I will simply sit here on the shore, look at the wicked sea, and cry for my clever prince who lies in the cold depths." "We will howl every night," cried the dogs. "We don't care if we change into sea dogs. We'll never forget our dear Johnny." Uncle Lucas was silent. Why do they like Johnny so much? he wondered. Johnny was a bad boy, with no respect for his old uncle. It seems that the bear and the dogs have forgotten they belong to me. And everything on this island should belong to me, too. I am the only member of the human race here. And all the animals should obey my orders. He approached his companions again. "I want to tell you something," he said to Captain Cat. "All right, go ahead," grumbled the cat in disgust. "I want to tell you something," repeated Uncle Lucas. "But you have to promise not to do me any harm, even if you dislike what I'm going to say." The cat hissed and spread his paws so the nails showed. "I presume you want to tell us that you intend to go home, that the barge is yours, that the treasures are yours, and that you want to take everything with you and be our leader." "Now listen, you bad man," continued the cat, in a threatening voice. "People like you should stay away from all living creatures, because your heart is as hard as a rock. All of us who will stay on this island intend to live together in peace. Therefore, you can go home with our blessing. You will get ten gold coins, the real value of the linen, tools and nails you sold us. Fuzzy and the dogs will help you build a raft. We'll give you food for your journey. And go! Go as soon as possible!" It may be better for me to go, thought Uncle Lucas. Nobody likes me and, anyway, I'll get ten gold coins. "I've been cheated as usual," he said, very offended. "Of course I'll go, because your ingratitude hurts me deeply. But before I go, I'd like to look at the famous treasures. Let my poor old eyes feast on the sight of gold and precious gems, inasmuch as I can't take them with me." Captain Cat, disgusted as he was, couldn't suppress a smile. "You are an odd sort of miser," he said. "But I will allow you to see the treasures. It will be a way to punish you. You will remember all your life that this immense treasure doesn't belong to you. Follow me." That's the idea, thought Uncle Lucas, joyfully. I'll find where the treasure is hidden and later . . . We'll see. Captain Cat pushed three times on a button hidden in a huge coral rock. A narrow passage opened up suddenly. "This leads to the treasure room. Go and have a look." Breathless from excitement, Uncle Lucas entered a big square cave. In neat piles, hundreds of bars of gold were lying on clean sand. Baskets full of the most wonderful emeralds, rubies and diamonds were standing around. The gems threw glittering lights all over the walls. Heaps of snow-white ermine completed the enchanting picture. "There are no greater treasures anywhere in the world," said the cat seriously. "Why didn't Barnac transport them to his estate?" asked Uncle Lucas in a trembling voice. The cat shook his head. "It took pirates years to accumulate these treasures. The price paid for them was innocent lives and blood. That is why Barnac doesn't want them. The precious gems are cursed; the gold is cursed; the furs are cursed. The very walls are cursed." "I'm not afraid," said Uncle Lucas. He puffed out his chest. "I'm willing to take them." "Oh, of course, I don't doubt that," said Captain Cat severely. "But you may take only ten gold coins. I doubt that they will bring you luck. That's not my business, however. The only thing Barnac wanted was the seven-league boots." There they were, enormous boots, leaning up against the wall. "If Johnny were here," said the cat sadly, "he'd alter them to fit Barnac. 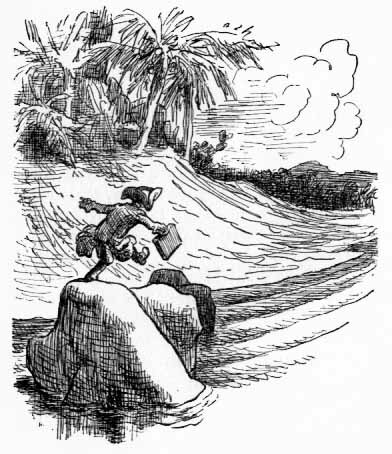 Then Barnac could walk all over the world, visiting foreign lands. But Johnny is dead and now the boots will rot. That's very, very sad." He wiped his tear-filled eyes and added: "But you can't understand what I'm talking about. Here is your gold. Now go!" Uncle Lucas trembled with rage while listening to Captain Cat's disdainful words, but he kept silent. They left the cave. Captain Cat pushed the hidden button again. The entrance disappeared. No one would have thought there was a cave hidden inside the rock. Uncle Lucas spent the day pretending to work. He seemed to be very busy. He cut wood, drew plans, assembled materials for a raft. But if anyone had noticed him closely he would have realized that Uncle Lucas was not working at all. The cats, the dogs and Fuzzy were so busy themselves that they didn't pay any attention to him. The barge was in bad condition after the storm. There was a great deal of repair work to be done. At nightfall all the animals went into the shelter of the woods. They fell asleep immediately on the soft moss. "Captain Cat, may I stay on the barge for the night?" asked Uncle Lucas. "It's so much warmer and so much more comfortable than the forest." Captain Cat was surprised by Uncle Lucas' soft voice and polite question. Could it be that his lectures were at last making an impression on the unpleasant man? "Of course you may," answered the cat, with equal politeness. "I hope you'll be able to leave tomorrow. I'm glad to grant you this last request." "I will leave. . . . Of course I will leave," mumbled Uncle Lucas to himself. "Little you know, miserable cat, how soon I will leave! But you'll be here a long time. A very long time!" It was a quiet and beautiful night. Moon and stars shone brilliantly in a cloudless sky. It was as bright as daylight. Gentle breezes murmured through the trees. Quiet reigned over the island. But if some of the animals had awakened and come to the seashore they would have seen an incredible thing. Uncle Lucas crept up to the coral cliff, pressed the button, went inside the cave and started dragging the treasures to the barge. "These treasures are all mine! Mine!" he whispered to himself. "And the seven-league boots, too! Everything is mine! I would rather lose my life than give up these wonderful gems and this beautiful gold. I will spend my life counting it night and day, day and night, every day of my life. I will enjoy the glittering brightness and this wonderful tinkling for years to come!" Bending under the heavy load, he carried the treasures from the cave to the barge, going back again and again for more. Sometimes he fell down, he was so tired, but at last the cave was empty. Uncle Lucas went on board the barge. He unfurled the sails with great difficulty, and untied the boat. Gentle winds soon blew the barge away from Coral Island. By the time they get up, I'll be far away, he thought. I'll manage all right even if the journey takes ten years. I'll stop on other islands. I'll ask the seafolk for directions. It won't even matter if I have to spend the rest of my life on a desert island. I'll hide with my treasures in a cave. I'll have a wonderful time just counting the gold and looking at the gems and feeling the ermine. Uncle Lucas took the helm. He was a sight to behold – skinny, his sack suit in shreds, his eyes shining like burning coals. Nothing in the world mattered to him. Nothing but the cursed pirate treasure. He stood at the helm until dawn, sailing to an unknown destination. MEANWHILE, Johnny got up after a good night's rest and, stretching in the bright morning sun, said to himself, It's so sad to be without my friends. I have to think about how to find them. The little whale could do a lot for me, if he wanted to. But he's such a lazy and flighty creature. Let's see what kind of mood he's in today. The rising sun threw fresh, bright rays on the shore where the baby whale lay on his belly. He was playing with the water. He drew it in and then blew it out in a mighty stream which shone in the sun like many-colored crystals. "Hello, you boy with the needle!" he exclaimed. "Did you have a nice sleep? Are you now as dry as a chip? I got all the sleep I want in one night. A sea crab was here a moment ago and brought your Sea Passport. It's from the stitched shark, and it's valid for shallow, medium and deep waters. It's a great honor and may be of great value to you. All the seafolk are obliged to help you. Everybody, from the largest whale to the smallest clam." There, indeed, was the passport. It was lying on the whale's back, a snow-white, flat shell with odd signs written on it. "Here it is," said the whale. "Keep it carefully." Johnny put the precious passport into his pocket and said, "Now I'll hurry and fix you the new rainbow skin I promised you. And then I'll have to ask you many favors." 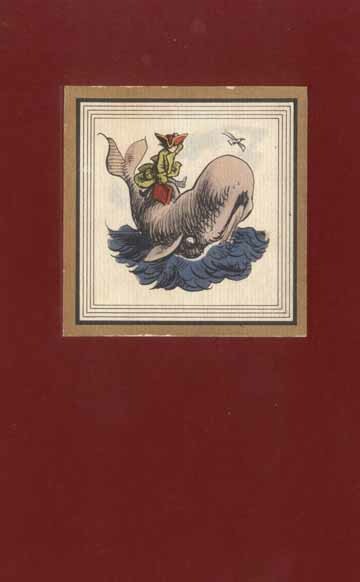 "I will be of help with great pleasure," answered the whale graciously. Once again Johnny sat on the whale's back with his red box and started to work. He put square pieces of mother-of-pearl into the whale's skin. He matched it and polished it nicely until it looked like a glittering chessboard in the golden rays of the sun. "Finished," said Johnny. He looked at his job proudly. "You are beautiful now, my dear whale. I can't put this mother-of-pearl too high or it would feel like a stiff collar around your neck. But believe me, there is no whale in the whole world with such an extraordinary ornament." "I imagine it must be gorgeous," answered the whale. "I'm sorry I can't see it myself. Trying to see it, I could easily sprain my neck." "I can help that, too," said Johnny with a smile. In the pocket of his long coat he found a mirror. He broke it into two and put each part on the cliff in a different place. 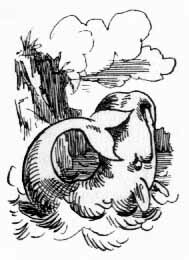 The whale was then able to look into one part and see his back reflected in the other. He snorted delightedly like a horse. "I am entirely pleased," he spoke out at last. "You have my lifelong gratitude. How can I reward you? Maybe you'd like some whale oil. The Eskimos do. I can give you a hundred barrels that I have stored in my sea basement. Or perhaps you'd like to wear a corset. Your coat would fit much better then. I can give you twenty pounds of the best whalebones. Your every wish will be granted." Johnny thanked him politely for the offer of the oil and whalebones. "I have a personal and urgent matter to settle on the deep waters. As the holder of Sea Passport Number Seven, I call on you for assistance." The whale immediately came to attention and put his tail to his head in salute. "At your command," he said. "Your orders, sir. I obediently and attentively listen." What an excellent passport, thought Johnny. Now I'm sure I can find my friends. "I want to cross the sea immediately, lengthwise and crosswise, to the north, east, south and west. I must travel fast and comfortably." "Oh, that's easy," said the whale. He knocked with his tail on a rock. "These are signals to the seafolk," he explained to Johnny. "They are whale signals, speed signals, multidirectional, wavy, slanting and zigzag." A few minutes passed. Then there was a great movement on the surface of the sea. Big sea crabs swam up and down; octopuses circled around; oysters opened and shut their shells with a crash. Suddenly Johnny saw a huge tortoise shell coming toward him rapidly. It was big enough for ten boys Johnny's size. Powerful sea crabs, their claws covered with barnacles, pulled it along by strong seaweed ropes. They were assisted by long-tentacled octopuses and slim, strong fish. "This is your multidirectional ship," said the whale. "The crabs will pull the shell in a straight direction, the octopuses in a round direction, and the fishes in a zigzag direction. By combining these directions you can go in other directions – slanting, spiral, wavy. For your protection, twelve sharks will swim ahead, and twelve behind. Moreover, snow-white sea gulls will soar overhead. If there's any danger they'll immediately send word to our sea police, the swordfish. Stand by, all you seafolk, in the shallow, medium and deep waters! We need patrols over the whole sea." "What a ride!" said Johnny joyfully. He shook the whale's tail in thanks. "Oh, that's only our usual sea hospitality," said the whale matter-of-factly. But he noticed Johnny's appreciation with satisfaction. "In which direction are we going?" asked the helmsman. "We are going in all directions," said Johnny very positively. The poor crab wrung his pincers in despair. And Johnny, reading his thoughts, smiled. "But of course not in all directions at the same time," he said. "Giddap," ordered the crab. He flicked the right octopus with the seaweed rein. The tortoise shell moved forward swiftly. Ahead and behind, the sharks watched the seas carefully. The oysters opened their shells to trumpet the announcement: "Here he comes! Here he comes!" Obeying the command to fall in, the swordfish formed a line, crossing their swords in salute. And the seagulls twittered excitedly: "He's coming! Prince Johnny is coming. The prince with his Sea Passport in the right pocket of his long coat!" MEANWHILE, Uncle Lucas was having his troubles. From the very beginning of his trip he had bad luck. He lost his way several times. The deck became unbearably hot at noon and Uncle Lucas was forced to hop like a bear learning to dance. Because he was dancing he became thirsty. Then suddenly he realized that he had failed to bring a supply of fresh water. I have to land somewhere as soon as possible, he said to himself. I don't have any food, either, and I'm getting thirstier every minute. At that very minute a flock of sea gulls flew overhead and twittered gloomily, "Cursed treasures! The wicked miser is carrying them away!" "Stupid birds!" exclaimed Uncle Lucas angrily, in a voice hoarse with thirst. "I'd like so much to be alone, far away from these birds and all living things. Everyone interferes with my business. And everybody talks about me without respect. That's the way it is nowadays." But the birds came nearer and nearer, calling out: "These treasures should sink to the bottom of the sea, and the wicked miser with them. They should disappear from the earth, and even the memory of them should disappear. And the memory of the pirates, too, who killed innocent victims for this loot." Suddenly the birds charged at the sails, and pecked them with their sharp beaks. "Crazy birds!" shouted Uncle Lucas. "What are you doing? My linen, my dear linen! What will become of me without sails?" But it was already too late. The sails were badly damaged. They looked like sieves. The barge, spinning around several times, drifted slowly with the waves. The sea gulls flew away, laughing at the plight of the traveler, but only to call the seafolk for more help. What they really wanted was to sink the barge. Uncle Lucas fell down on the deck. "Everything is lost," he whispered with parched, swollen lips. "I am lost. Oh, how thirsty I am! I'd give all my treasures for just one drop of water! At last I realize that neither gold nor diamonds nor precious gems can save me from thirst, hunger and death. All my life I denied myself everything. I hoarded, hoarded, hoarded endlessly. And now I own treasures worth millions – but I have to die on this gloomy sea." Uncle Lucas closed his eyes, immensely tired. Tossing restlessly in his sleep, he dreamed of clear mountain streams. "Drink! Water! Water!" he whispered. "The wicked miser is dying with his treasures! Dying! Dying!" twittered the sea gulls high above the barge. For a while they kept silent, then called out again: "Johnny the prince! Johnny is coming! Johnny the honored guest of the seafolk! With his Sea Passport in the right pocket of his long coat!" Uncle Lucas moved restlessly. "Johnny! Johnny's coming!" he repeated in his feverish dreams. Suddenly he awakened. He rubbed his red-rimmed eyes and mumbled: "I thought somebody said Johnny was coming." He struggled to his feet and looked around. Not far from the barge he saw the enormous tortoise shell, pulled by crabs, fishes and octopuses. Johnny was sitting comfortably inside. His hat was pulled low over his nose to protect him from the sun and one of the octopuses was fanning him with its longest tentacle. "That's Johnny alive!" Uncle Lucas suddenly realized. "I am quite sure he won't help me now after all the harm I've done him. No, on the contrary. He'll let me die here. This will be the end of my journey. I got the treasures but I lost my life. I'm sure no one will weep for the death of old Mr. Longfoot. And they'll be right, because my life was worthless. And now it's too late to start over again." Suddenly he heard Johnny's voice. "Uncle, dear Uncle! What are you doing here? Wait a minute' I'll be right with you." Johnny stood up in the shell. "Speed up!" he shouted to his crabs, octopuses and fishes. At last he was so near he could climb on the barge. He ran to his uncle and exclaimed in pity: "Poor Uncle! What happened to you? You look pitiful. Don't be afraid. Your nephew is with you. I will certainly help you and do everything I can for you." Uncle Lucas said softly: "I did a terrible thing. . . ."
Then he fainted. Only then did Johnny realize that his uncle was dying of thirst and hunger. Immediately he gave orders to some sea gulls to bring water in their beaks from a near-by island. "We have to obey you," said one of the sea gulls, "because you are the owner of a Sea Passport. But, believe me, your Uncle Lucas doesn't deserve even one drop of water." "That's neither here nor there!" answered Johnny. "He's dying, and it's my duty to save his life. We can decide later what to do with him." Soon the sea gulls were quenching Uncle Lucas' thirst with drops of water from their beaks. After each drop he improved. He drank and drank and looked gratefully at his nephew. "Thank you, Johnny," he whispered. "Could I have a talk with you?" Johnny looked at the sea gulls and said, "You are dismissed now. Go and tell the crabs, octopuses and fishes to rest for a while. I'll call them after I talk with Uncle Lucas." Then Uncle Lucas started his confession. He told Johnny everything: about his wicked act, how he stole the treasures and the boots, and how he left the animals to starve on the coral island, when he took the barge away. While telling the story, he cried the whole time. But he wasn't collecting tears any more. Quite the contrary. He said he didn't want even one more tear. He said he had decided not to hoard any more, because he knew now that treasures do not bring luck. "I will try to become generous," said Uncle Lucas. To give proof of it he tore a piece off his sack suit and threw it into the sea. Johnny smiled. "Dear Uncle," he said, "don't cry any more. And don't try to become generous overnight. You could get dizzy from the sudden change. Nothing has happened that can't be set right. The treasure will go back to the island. I will fix the boots for Barnac. We'll find the animals, and I'm sure they'll like you from now on. Only try to smile or laugh as much as possible, and everything will be all right." Uncle Lucas, sweet now as a lamb, opened wide his mouth and laughed. "Ho! Ho! Ho!" "That's not the right kind of laugh for you," said Johnny kindly. "You have to find your own laugh. Ho, ho, ho, is the laugh of very common people, who slap their legs while laughing. Try something else." "Hi, hi, hi," squeaked Uncle Lucas. "That's wrong again," said Johnny. "That's how little girls laugh. It's more like a giggle, not a real laugh." Many kinds were tried. Finally Johnny approved a "Ha, Ha, Ha!" "That's the right thing," he said. "For such a tall and thin man as you, the proper laugh is Ha, ha, ha." Uncle Lucas tried it again. "Ha, ha, ha!" "That's fine. Now learn it by heart. Meanwhile, I have to order some food." Johnny called the crab helmsman. "My uncle and I," he said, "want to have a good dinner. We would like to have a seaweed salad, fried fish, and cream made from sea cow's milk." "That's easy," the sea crab helmsman said with a bow. Into the sea's depths he ordered: "Two salads, two fried fishes, two creams, quick! That's that," he said, turning to Johnny. "Can I do anything else for you?" Johnny thought awhile. He recalled that his vacation was nearing its end. It was high time for him to settle everything and go back to his father, for whom he was beginning to long greatly. So he said, "The sea gulls destroyed our sails. I need new linen." "That's easy, too," said the crab proudly. "We have very strong linen made of sea plants. It's as smooth and thin as silk, and it's practically indestructible." "That will be the right thing for me," nodded Johnny. Soon two big octopuses brought several pieces of linen. Others served dinner on beautiful shells. Uncle Lucas was so starved that he simply devoured this delightful meal. "Ha! Ha! Ha!" he laughed. "It tastes much better than bark. How stupid I've been all my life!" "Food just didn't matter to you," said Johnny politely. "But because that's the way you felt, you wasted your best years in hunger and unhappiness. Now everything is changed. You'll see how happy life can be." After dinner they cut and sewed the sails. When they were ready, Johnny said good-by to the crabs who were standing by for orders. Then he patted the octopuses and fishes on their heads and said, "Thanks a lot for everything. And I wish you all luck and good health." The crabs, octopuses and fishes really wanted to shed some tears because of this sad separation. Since they didn't know how to cry, however, they only said: "Good-by, Johnny. And good luck to you too." Then they swam away. And now Johnny, following his uncle's directions, was steering toward the coral island. "Where are the seven-league boots, Uncle?" asked Johnny anxiously. "I have to get to work on them right away. They were the reason for this whole expedition. I have to alter them for Barnac, as you know." "They are below the deck," said Uncle Lucas, ashamed. "I hid them there, because I intended to alter them for myself. But now I'm very, very sorry." Without a severe word, Johnny went downstairs and returned with the seven-league boots. Because of the water that had dripped on them from leaks in the deck, they were in very bad condition. They were wet down to the last piece of leather. "It's my fault the boots are ruined," said Uncle Lucas, deeply penitent. "Not at all," smiled Johnny. "On the contrary, it's given me a good idea of how to fix them. I would have had to work for months on these boots to make them fit Barnac. Now I'll need only a few hours." Then he took the boots and put them on the deck right in the sun. He himself sat down at the foot of the mast and kept constant watch on them. This seemed amusing to Uncle Lucas. That's odd, he thought. I certainly appreciate my nephew's ability, but I don't believe he can alter boots just by looking at them. But that was what seemed to be happening. Uncle Lucas became frightened because the thought came to him that Johnny must be a great magician. Goodness! he thought. Johnny could easily have changed me into a rat, mouse or worm. He could have done anything he wanted to me. But he didn't. So I presume he's not only a great magician, but also a good one. The shoes were getting smaller every minute. Finally Johnny got up and said: "They are ready now. I remember the size of Barnac's paw exactly." "How did you do that?" asked Uncle Lucas in a trembling voice. "How can you make shoes smaller just by looking at them?" Johnny eyed his uncle anxiously. "I'm afraid you're still not feeling quite well," he said kindly. "I was only watching to keep them from getting too small. The sun is rather hot today, and they were drying fast. When wet leather dries, it shrinks, you know." "Oh, I see. So that's it," sighed Uncle Lucas in relief. And he laughed merrily. "Ha! Ha! Ha! My nephew's very smart. But thank goodness he's not a magician. Are they really seven-league boots?" Johnny shook his head. "I don't know. That's what Barnac called them. It makes no difference to me because my business is to fix shoes, not to say what to do with them. A shoe is just a shoe to me, be it a seven-league boot, a one-league boot, a short-distance boot or a long-distance boot. It's all the same to me. It's Barnac's business. I'm sure I didn't harm them because I didn't even touch them. And now, dear Uncle, let's make you a beautiful suit out of this green-gray linen." "Also only by looking at the linen?" asked Uncle Lucas, smiling. "Oh, no, indeed. It will take lots of work." "I protest," interrupted Uncle Lucas decisively. "I'm generous now. My nephew who visits me for his vacation is not supposed to work. I will buy myself a nice suit and shoes when I get back home. Meanwhile, I'll just wrap myself up in some of the cloth." "How quickly you've changed, Uncle Lucas," marveled Johnny. "I think greediness is a kind of disease. And you simply were sick. You were full of the green and crooked germs of greediness. Your long fast must have killed them." Johnny stopped talking suddenly, because he realized that the barge was rushing ahead with tremendous speed. "I don't understand what's going on," said Uncle Lucas in astonishment. "The wind is not strong. Yet the boat is moving very fast." Johnny looked at the sea and only then realized that twelve sharks were silently pushing the barge along with their mighty heads. "That Sea Passport of yours is certainly a useful thing," said Uncle Lucas. "If things go on like this we'll get to the coral island very soon." But at that very moment a tremendous crash warned them that something had gone wrong. The barge staggered, wheeled around and keeled to one side. "We are sinking!" cried Uncle Lucas in great alarm. But right away he remembered that he had promised to be cheerful at all times. So he added, "What fun! Ha! Ha! Ha!" What had happened was that the boat had struck a large rock and the bottom was pierced. In their eagerness to hasten the barge along its way, the sharks had not noticed the rock. There was little hope of saving the barge for, in a few minutes, it was almost entirely under water. "If it weren't for the weight of the treasures," said Johnny sadly, "we might have been saved. But the ship is too heavy." "These treasures are cursed," said Uncle Lucas sorrowfully. "Maybe it's best for them to sink." "I hope they do sink – without us!" exclaimed Johnny fervently. "Life is beautiful and I want to live." "I, too," agreed Uncle Lucas vigorously. "Well, then you'd better help me, Uncle, as fast as possible. We have ten minutes. By then the barge will have sunk." Johnny called the sharks, who were looking with sorrow at the disaster they had caused. They were moving their tails in great grief. "Hey, you there, unlucky ones! Call the sea winds. I need them badly. Tell them to blow in the direction of the coral island, starting in nine minutes. Choose the strongest winds. Sea gulls and other flying creatures must get out of the way. The road has to be entirely clear. Give the signals." "At your command," mumbled the sharks. They speeded away in a flash. "Winds! Winds!" they called. "Where are the sea winds? We call them in the name of Sea Passport Number Seven. Oysters, click your signals! Alarm! Alarm!" The whole sea – the shallow, the medium, the deep – was in an uproar. From the smallest sea creatures to the largest whales all were calling out: "Alarm! Alarm! Winds! Winds!" The air was filled with roars, croaks, rattle and clatter. But the sea winds, having been busy all day long, were resting just then on a high cliff. When he heard the call for help, one wind rose to his feet and stretched his arms. Little ripples came over the water. "I'm getting weaker and weaker from lack of rest," he murmured. "I wasn't even strong enough to sink a ship recently. I succeeded only in smashing all her masts." But, nevertheless, he awakened his companions and they all soared up. Whirling around, they drew up in line of battle and shouted, "What are the orders?" "Dot-dash, dot-dash," answered the oysters, hidden in the rocks. "Dash-dash-dot-dot-dot. All go, all blow in the same direction, the direction of Coral Island. Blow past the sinking barge with the holder of Sea Passport Number Seven, Prince Johnny, on deck." "That's a trifle for us," said the leader of the winds. "As he is obviously an important person, we want to do our job well. Brothers! Let's keep together evenly. Don't let anyone get out of line, not even by a whale's head." And off they went. Meanwhile Johnny and Uncle Lucas were working feverishly. They cut the sails from the mast and sewed them together. They fastened them to thin pieces of wood. Johnny counted while working: "One, two, three, four, five . . . ten . . . twenty . . . sixty! One minute! Two minutes! Three minutes! . . ."
"It seems to me we do a lot in a minute," said Uncle Lucas, wiping his brow and breathing heavily. "But what is it we're doing?" "We're making a kite," answered Johnny shortly. He really didn't have time for a longer conversation. After nine minutes the kite was ready. Picking up the red leather box and Barnac's boots, Johnny asked Uncle Lucas to tie himself and Johnny to the kite by the strongest ropes he could find. The barge was almost completely under water by now. At the same time the winds approached, and lifted the kite strongly but gently. "Ha! Ha! Ha!" laughed Uncle Lucas, though with a trembling voice, when he found himself high in the sky, dangling with Johnny from the kite. "What a wonderful way to travel! Ha! Ha! Ha! The only thing I can't understand is why I'm so cold. Usually moving around keeps me warm. And we're certainly moving now." Uncle Lucas closed his eyes, to think over this problem. Johnny was lost in thought, too. Everything, even the best, must come to an end, he thought. It's nice to travel, but now I'm ready to go home. Now that I have the seven-league boots, and the treasures no longer exist, the only reason for going back to the coral island is to pick up my four-legged friends. But how? If the winds die down over Coral Island, how do I know I'll be able to get them to blow again? I have to use them while I have them. Aloud he shouted, "You, winds! Please go as slow and as low as possible over the island. We have to pick up a small load and then go on." "As long as we're over the sea, we will fulfill your wishes," the leader called back. "But remember, we are sons of the sea. And we are not allowed to fly over the mainland." "That's all right with me," mumbled Johnny. He fastened more ropes to the kite. Faster and faster they were blown through the sky. At last they saw Coral Island. One of the winds roared, "Coral Island! Slow down and lower your flight!" This was not easy for the fast winds. They moaned as they curbed their speed. Johnny looked down at the island rising before them. "I see the cats, the dogs and Fuzzy on the shore!" he exclaimed happily. "They see us! They see us!" And he waved and shouted with all his might. CAPTAIN CAT watched Johnny's movements carefully with his extremely sharp eyes. 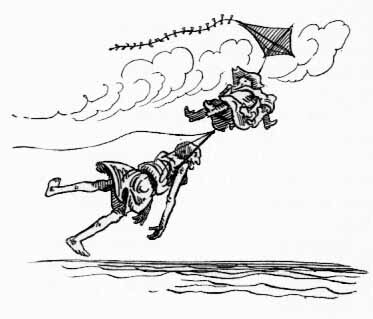 The kite to which Johnny and Uncle Lucas were tied was approaching slowly. "By the way Johnny is waving his right hand, wiggling his left hand, turning his left index finger and twisting his right thumb, I judge that we are supposed to catch hold of the ropes," decided Captain Cat. "I don't understand why Uncle Lucas is with him, or where the treasures are, or what's going to happen to all of us. There'll always be time enough to commit hara-kiri – but right now there's only one minute in which to catch hold of the ropes. Please, dogs, cats and Fuzzy, do this as quickly as possible." The kite was now directly above the island. When the dangling ropes hit the seashore, all the animals caught them with their claws and teeth. Then Johnny shouted to the winds: "Full speed ahead!" Soon they were flying unbelievably fast. The winds raced madly. They completely forgot Johnny, the Sea Passport, the kite. They were racing because they enjoyed racing. Down below them the sea was churned into stormy waves. The clouds were chased all over the sky and then driven back again. Fortunately the travelers didn't realize all this. The tremendous speed made them dizzy. They could hardly breathe. No one could say how long the journey lasted, whether a moment or a year. Suddenly the leader of the winds roared to his brothers, "Attention! Shore off the mainland! About face!" At this command the winds turned immediately and left the kite. But the kite still floated, gliding slowly down, little by little. "Everything's working out right," said Johnny happily. "We are now above the mountains. I imagine we'll come down on the far side. That won't be far from Barnac's or from Uncle Lucas'. It looks as if our journey will have a happy ending." There was nothing to do but wait. Everyone hung from the ropes patiently, and Johnny told his friends about his experience. "Thanks, Johnny," miaowed Captain Cat, swinging on his rope. "You are a priceless boy. Thanks to you, my honor is saved. The most important thing was the boots. The loss of the treasures isn't important. Barnac didn't want them." "Never mind the treasures. Treasures are unimportant. They never bring you happiness anyway," declared Uncle Lucas. "How your uncle has changed!" remarked Fuzzy, amazed. "It's really wonderful if it's true." "It is true," answered Uncle Lucas proudly. "It's so true that from now on there'll be no wild watchdogs or dangerous bears on my estate. Curly, Brownie, Spotty and Fuzzy will all get nice pensions from me. They can have a real rest for the balance of their lives. They can live at Shoestring Manor, or in the mountains, or forests, or wherever they like." "Thanks a lot," answered Curly politely. "We've decided we'd like to travel a bit more. We'd like to take a trip around the world." "If that's what you want to do," suggested one of the cats, "why don't you talk to Barnac? He knows all about traveling. He might even go with you, especially now that he owns the seven-league boots." This friendly conversation in the air came to an end because the kite was now quickly falling down between mountaintops. "That's perfect!" exclaimed Johnny. "I think we're landing near Barnac's estate." A few more minutes passed. The kite slid down, landed gently on the ground, and the passengers jumped off. "How good it feels to be on solid ground again," sighed Johnny, full of relief. He lay down on the sweet-smelling green grass. "What are our plans now, dear nephew?" inquired Uncle Lucas. "First I have to deliver Barnac's boots," said Johnny. "And then . . ."
"And then you come to stay with me," decided Uncle Lucas for him. "From now on, I'm taking care of you. And you'll have a really wonderful vacation. Go on to Barnac and finish your business with him. Then come back to me." "I certainly will, Uncle," promised Johnny. "And meanwhile," Uncle Lucas went on, "I will go to the nearest town and buy myself a whole new outfit, so you won't even recognize me. And I'll try to laugh a lot and get fat. As you probably know, it's very healthy to laugh. Healthy people always look plump. Ha! Ha! Ha!" So Uncle Lucas said good-by to Johnny and the animals, who were still amazed at the change in him. He left, still wrapped up in seacloth. I have a really good uncle now, thought Johnny with pleasure. We will get along well. I hope I can wind up all the business about Coral Island, the boots and the treasures in a short time. The travelers started on their way back to Catnap. There was no change whatever in Barnac's estate. There was Barnac, as usual, up on the roof. Only this time, instead of sitting on the chimney, he was curled up in a comfortable basket. Two strong cats held it. When he noticed the travelers, he ordered the cats to bring him down, and so they did. "How are you, Johnny?" asked Barnac. "I'm glad to see you. And you, too, Captain. And you, my cats. You must have lost weight during your journey. You all look extremely thin." He miaowed three times. The cooks appeared immediately to hear his orders, and quite an extraordinary dinner was then prepared. This dinner lasted for two days and two nights without interruption, while Johnny told the whole story of their journey. The dancing lessons, the climb through the mountains, how he stitched the sharks' and the whale's skins, how he fought the storm, and how he altered the boots. Barnac kept purring with delight. When Johnny finished his story he said, "You are a very clever and very brave boy, Johnny. I knew it the minute I saw you. I wasn't interested in the treasures, so it doesn't matter whether they're on the coral island or at the bottom of the sea. They were cursed and I didn't want them. But just think, after all you've been through, I can't even try out the magic properties of the boots. I am suffering dreadfully from rheumatism. I can't even move from my basket. The only thing I really need is a good masseur." "I could massage you," proposed Fuzzy. "I am strong, yet at the same time my paws are very gentle." "That's fine," agreed Barnac. "I hereby appoint you my personal masseur. You will get twenty pounds of nuts and ten pounds of honey every day." "Oh, that's too much!" exclaimed Fuzzy delightedly. "And," continued Barnac, "if I get well after your massages, we'll all start out on a trip around the world. I'll take Captain Cat, the dogs and Fuzzy with me. In that case, of course, the seven-league boots will be of great help. Would you like to go with us, Johnny?" "Thank you for your kind invitation," answered Johnny, "but Uncle Lucas and Father are waiting for me. I really have to leave right away. It's time for me to go now." 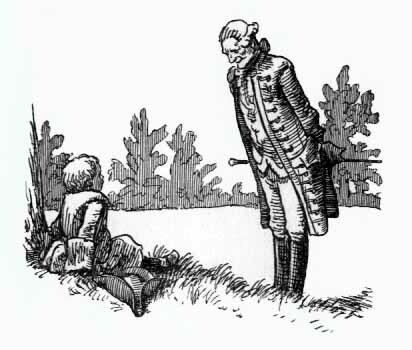 "Go, then, my dear boy," said Barnac. "But first I have to reward you generously." "No, thanks," answered Johnny proudly. "Everything I did was only for fun. And also, because I love animals. I don't need a thing. Especially now when I have a generous uncle who will take care of me." "That's true," said Barnac. "There are no limits when a miser becomes generous." So the moment of farewell came. Everybody cried – cats and dogs, Fuzzy and Johnny. The only sounds were sniffling and nose-blowing. Johnny had to promise to revisit Catnap someday. And he shook paws with the cats and dogs again and again. Even some of the mice came and rubbed their noses on his boots. "Good-by," said Johnny finally. "I'm sorry, but I really have to leave now. But I'll be back sometime. You'll see." "Yes, oh, yes, do that," exclaimed all the animals. 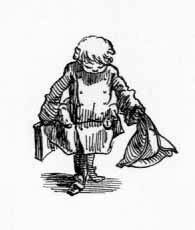 And, waving his handkerchief, Johnny started to walk to Shoestring Manor. He had a great deal to think about and he was very tired. The soft grass was so tempting that he lay down. I shall rest for a while, he thought. As soon as he lay down, his eyes closed, and he fell asleep immediately. He slept and slept. Finally, after a long time, he felt a touch on his arm. Johnny staggered to his feet and rubbed his eyes. A tall, handsome, well-dressed gentleman was standing beside him, smiling. Johnny had to look twice to be sure who it was. The gentleman certainly looked like his own Uncle Lucas – but how changed he was! But it was Uncle Lucas. He hugged Johnny affectionately. "I came to meet you, my dear boy. You were sleeping so soundly that I hated to wake you up." And, as if he had read Johnny's mind, he added, "I know you can hardly recognize me. It is not only this handsome new suit that makes me look different. It is because I learned so much during our journey. I learned that money doesn't always mean happiness, and that a kind and brave heart is worth more than all the jewels in the world. I am so happy to have you here, Johnny. I want your father to come to Shoestring Manor too. But now let's go. I'm sure you are very hungry, and there is a little snack waiting for you at home." Johnny had to admire the changes Uncle Lucas had made in the old house too. It was all scrubbed clean. All the windows stood wide open. A big table was spread with a white cloth and loaded with good food: strawberries and whipped cream, golden honey, brown bread and country butter, big plates of black cherries, cookies, and pitchers full of milk. Forgetting his adventures and Barnac's recent banquet, Johnny ate with delight. He ate and ate until he felt as though food was coming out of his ears. This was the beginning, not the end, of a wonderful vacation. Johnny's father came to join them at Shoestring Manor. Uncle Lucas became so fond of both old Peter and his son that he invited them to stay with him forever. So they stayed with Uncle Lucas and were all very, very happy. Johnny grew into a strong, healthy boy. The old Shoe King, Peter Longfoot, used to sit happily on the front porch of Uncle Lucas' fine house, smiling, rocking in his comfortable chair, and smoking his long-stemmed pipe. He was glad to be away from his dark, damp shoemaker's shop. They never talked about their expedition for Barnac the Cat, because Uncle Lucas never mentioned their adventures. Maybe he didn't want to. Maybe he just forgot. And Johnny never asked him about it. Gradually he forgot, too. Every day something new was happening in his life, and he had no time to think about the past, but only about the wonderful present or the future.